Plush red carpet. Sparkles. Twinkling lights. The star treatment. Lights, camera…chocolate?! OH YES. 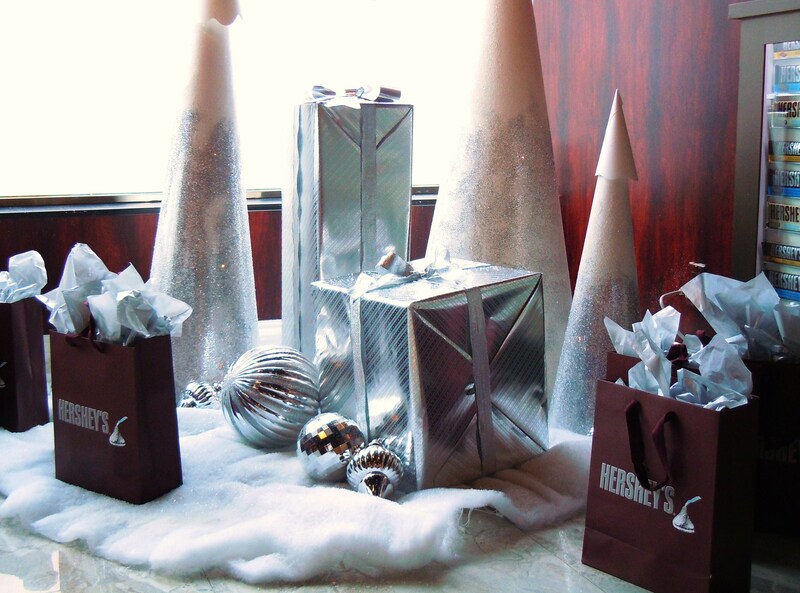 Bars and bars of melt-in-your-mouth Hershey’s chocolate just waiting to be devoured. Hot chocolate with jumbo marshmallows that resemble heavenly pillows of sweetness. And Facebooking, tweeting, and Instagramming your little social media tooshie off like you’ve never Facebooked, tweeted, and Instagrammed before in your life. The holidays just became THAT much sweeter my dear Torontoians! 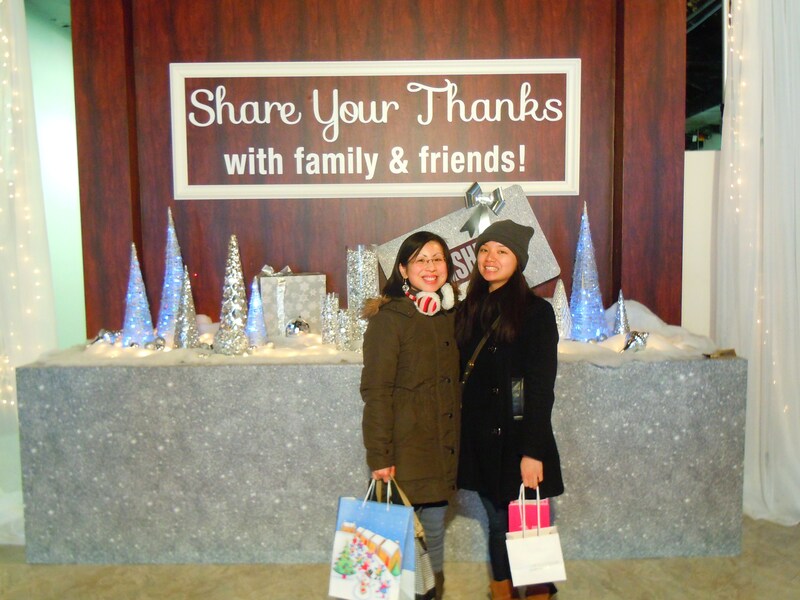 This weekend only, from Saturday, December 20 through Sunday, December 21 from 11am-7pm, Hershey’s Canada is giving everyone a chance to say “thank you” this holiday by inviting everyone to their special Thank You pop-up shop at 473 Queen Street West, just west of Spadina Ave.
Here’s how it works: stop by the store with friends and family (or just your awesome self), ogle the sparkly Hershey’s tree, travel along the red carpet to receive a Hershey’s chocolate bar of your choice (Cookies ‘n’ Creme, Milk Chocolate, or Whole Almonds) from a Hershey’s ambassador to give to a friend, family member, or loved one you want to extend a thank you to this holiday season. 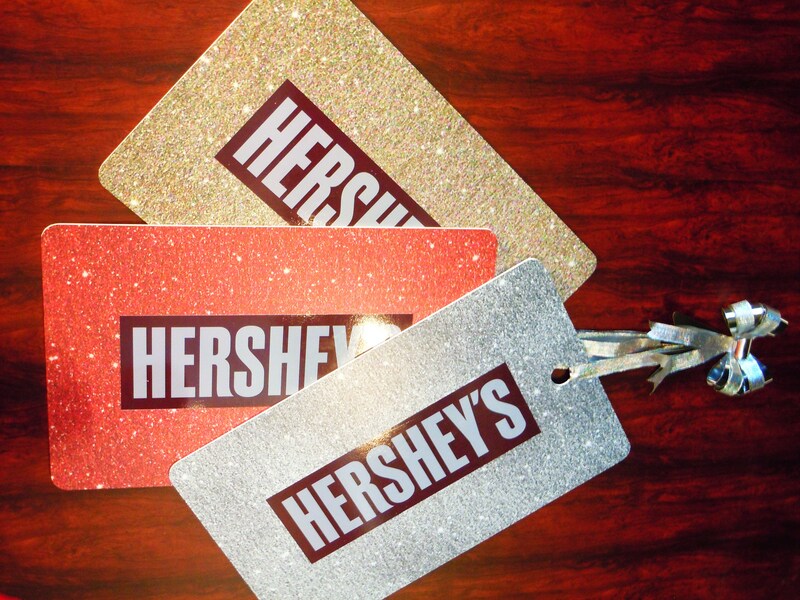 Choose a pretty Hershey’s tag to attach to said chocolate bar, grab a Sharpie marker from one of the cute little Christmas tins, and write a loving message on it. With ‘thank you’ chocolate bar in hand, make your way over to ‘center stage’ (it’s not really a stage, but you get what I mean! 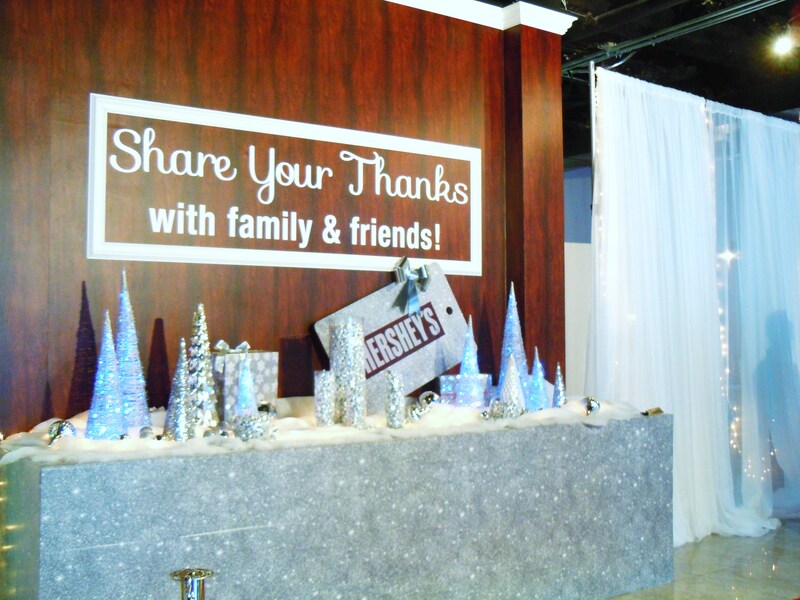 ), get your picture taken by a Hershey’s ambassador in front of the sparkly silver Hershey’s “thank you” wall, and if you like, have it uploaded and posted on Facebook right then and there to share with all your fab friends. 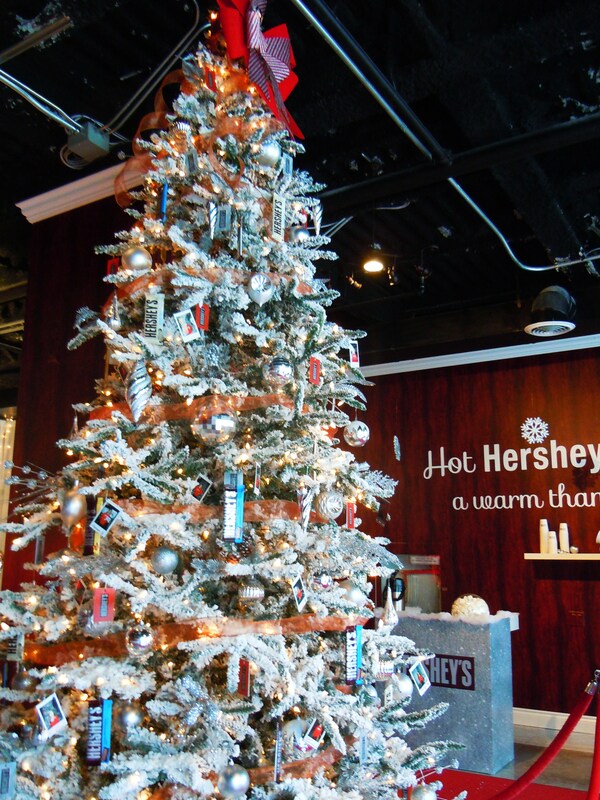 Then, to cap off the memorable experience, grab a cup of Hershey’s hot chocolate with jumbo marshmallow, and a chocolate bar of your choice for yourself to take with you on the road as a thank you from Hershey’s for taking part in this special holiday event. 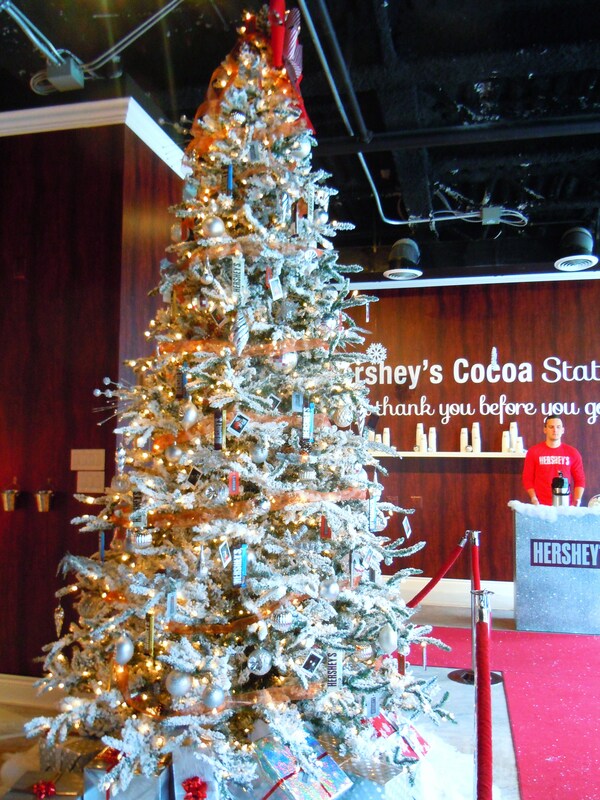 Leave the Hershey’s pop-up with a smile on your face and the warm and fuzzies in your heart! I received a special invitation to preview the pop-up this morning from the wonderful Ms. Hayley Findlay from Ketchum PR Canada so I have her to thank for this very special holiday experience which I shared with my dear friend, Sally. And really, that’s what this Thank You pop-up is really about: creating a unique holiday memory with friends and family, enjoying a sweet moment, and carving that little bit of time out of the hustle and bustle of the season to experience something fun, memorable, and delicious. 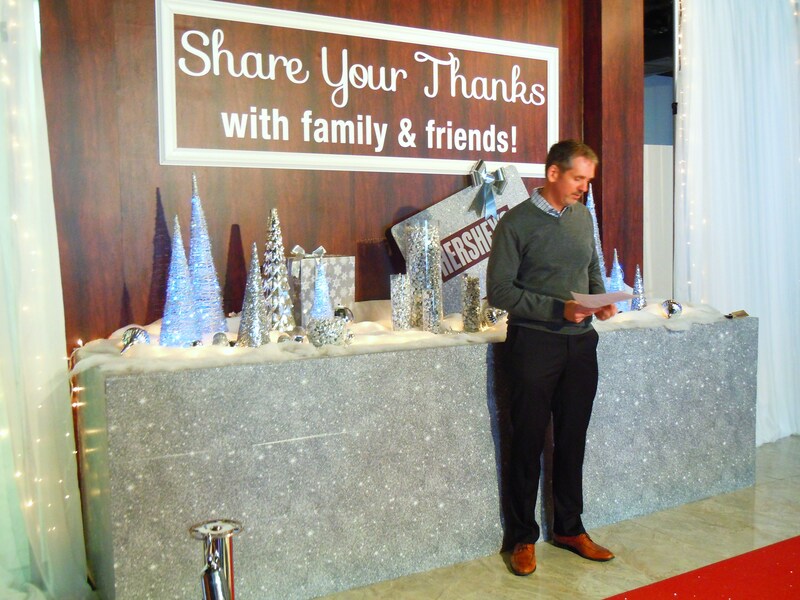 Pete Vanslyke, Director of Marketing for Chocolate at Hershey Canada, gave a speech in the middle of the preview to thank us for coming and to explain the rationale for the pop-up. Why have a Thank You pop-up? And why the weekend right before Christmas, one of the busiest of the year? The answer is simple: to make people happy with a one-of-a-kind holiday experience. A pay-it-forward, so to speak. 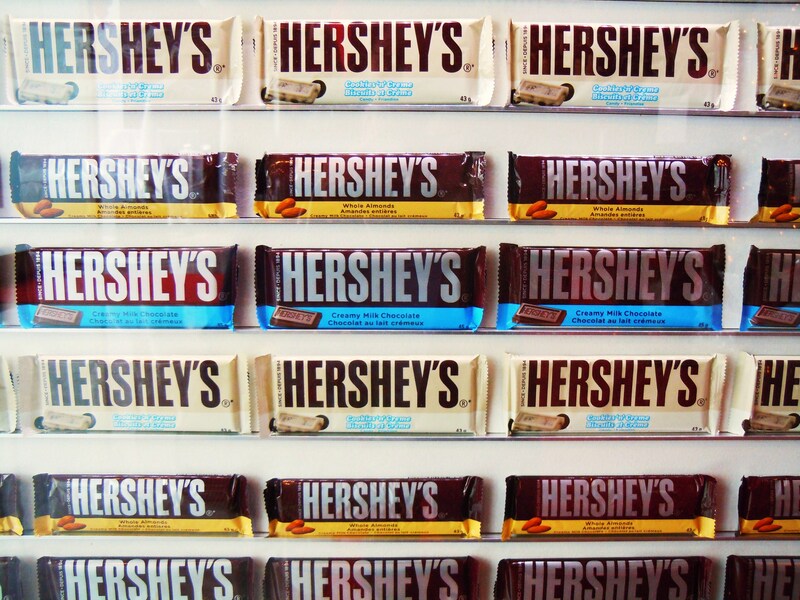 Hershey’s is thanking us for being loyal consumers. We’re thanking someone special with a bit of sweetness from the heart. The pop-up, to me, is really a way of tapping into a desire to capture, document, and share special experiences and moments with the people who matter most to us. Hershey ambassadors were at the ready to snap a few polaroids to hang on their tree and tablets were capturing photo after photo as we made our way down the red carpet. Let’s be real: many of us are guilty of snapping selfies and documenting the mundane moments of our lives and sharing them on Facebook, Twitter, and Instagram. And many do so on their phones; forget the humble computer (I do my work on my laptop and still use my desktop to print – you can call me grandma, it’s perfectly fine). You might even say that a touch of sentimentality has been lost in the process, what with page views, click-throughs, retweets, and likes overshadowing the heart and soul behind a photo that’s posted and shared. But when it comes right down to it, that urge to document, to share, and to tell stories through images via photography is still very much alive and well. It has merely evolved. Hershey’s know this and has come up with this concept space to fuse a little modern technology with the simple act of memory-making. And of course, chocolate. LOTS of chocolate. Happy holidays, everyone, enjoy the pop-up this weekend! 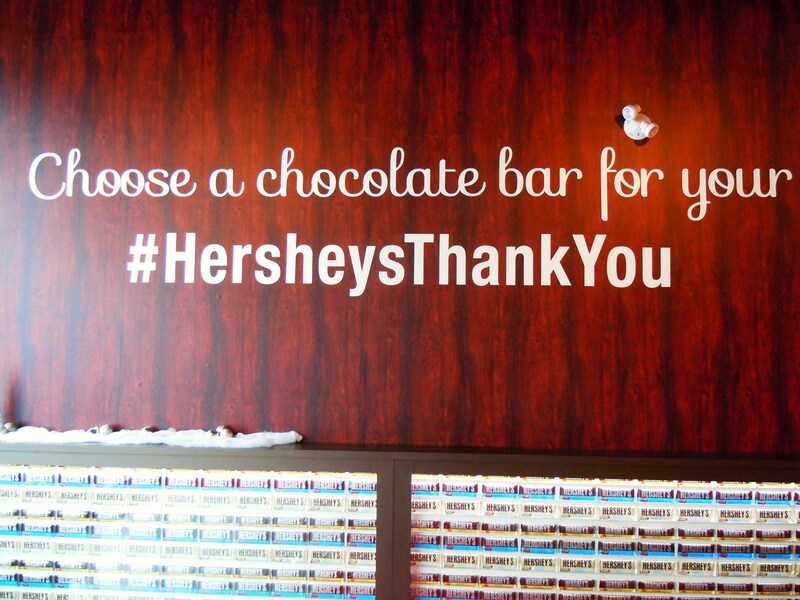 If you want to follow on social media, use the hashtag #HersheysThankYou and check out the Hershey’s Facebook page for photos and updates! 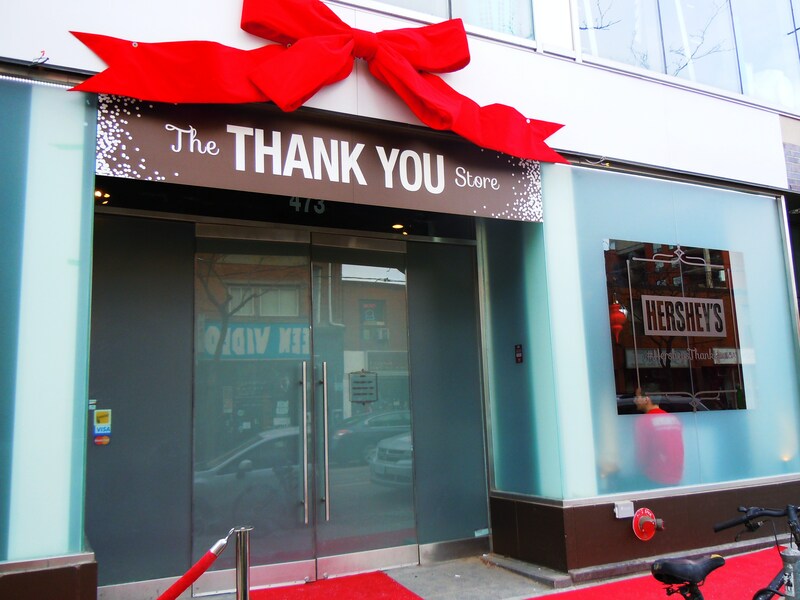 The Hershey’s Thank You pop-up store is located at 473 Queen Street West in downtown Toronto, just west of Spadina Ave. for this weekend only. 4 stops, 2 dozen macarons, 1 memorable, wonderfully delicious day. Macaron Day TO 2014 came and went last Thursday and despite the chilly, windy weather it was everything I hoped it would be! Even though I didn’t surpass last year’s total of 5 stops, I truly had so much fun and in addition to raising money for Red Door, that’s the point of Macaron Day: to have fun and to build passion, excitement and awareness for these mouthwatering desserts that we love so much. I hope everyone had a really great time noshing on macarons and being swept up in the excitement because I sure did! 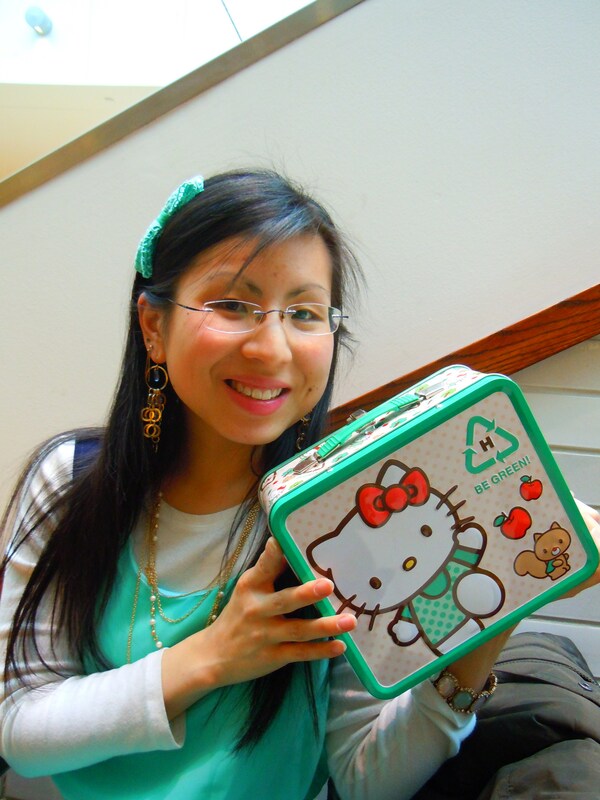 I was raring to go early in the morning with my trusty Hello Kitty tin lunch box in tow, waiting in the wings to be filled with luscious macarons throughout the busy day and I’m happy to report that the highly anticipated day didn’t disappoint. I passed by so many macaron-happy folks out and about with their baggies and boxes and I’m excited to find out if our final total for Red Door this year exceeded the one from last year. I’m hoping – fingers crossed! I had been anticipating this day for so long, not only because I was looking forward to having a ridiculous amount of macarons in my mouth and belly but also because March 20 is my anniversary with my sweetheart. 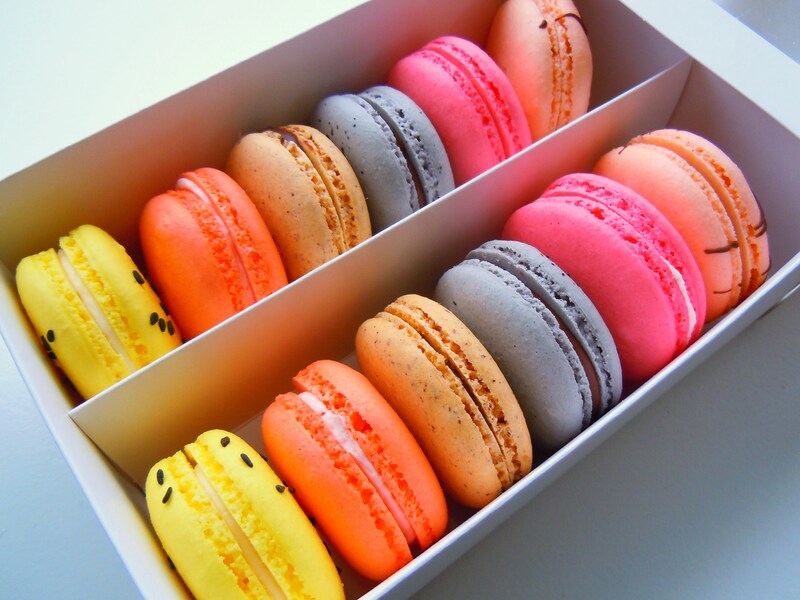 Macaron Day, my anniversary, and International Day of Happiness – it was meant to be. I switched up my Macaron Day route this year. For the last two years I generally stayed close to Yonge Street, attacking several different patisseries each time with a few repeats thrown in: in 2012 I hit up Patachou, Daniel et Daniel, La Bamboche and Petit Thuet and in 2013 I paid visits to Patisserie La Cigogne, Rahier Patisserie, and Yorkville Espresso Bar with return visits to Petit Thuet and La Bamboche. 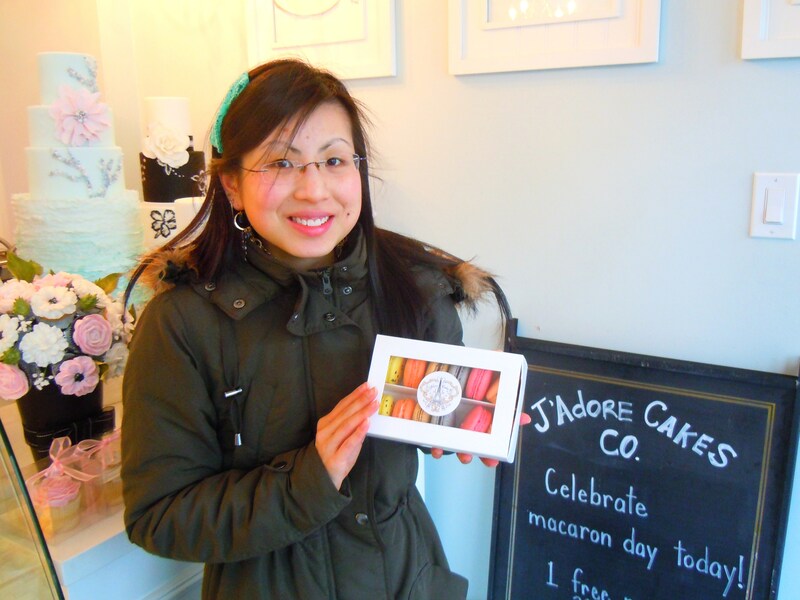 This year I really wanted to choose either an east or west end area and swing back central so I chose to start out east and I’m so glad I did because I FINALLY made my way to J’Adore Cakes & Co. on the Danforth after all this time! 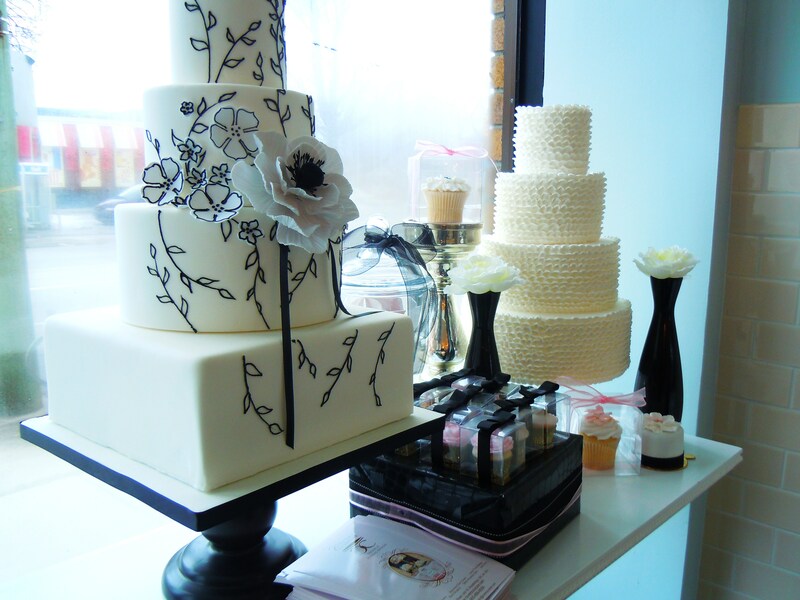 Located at 3308 Danforth Ave. in the east end of the city near between Warden and Victoria Park, J’Adore Cakes & Co. is a beautiful and sweet cake and dessert boutique and cafe specializing in cake design and all the fresh, homemade sweet treats dreams are of made of: cupcakes, donuts (owner Isabelle was a winner on Food Network’s Donut Showdown!) and macarons! In addition, the shop serves plenty of hot drinks and panini sandwiches for the times when you need some food to round out the sweetness. 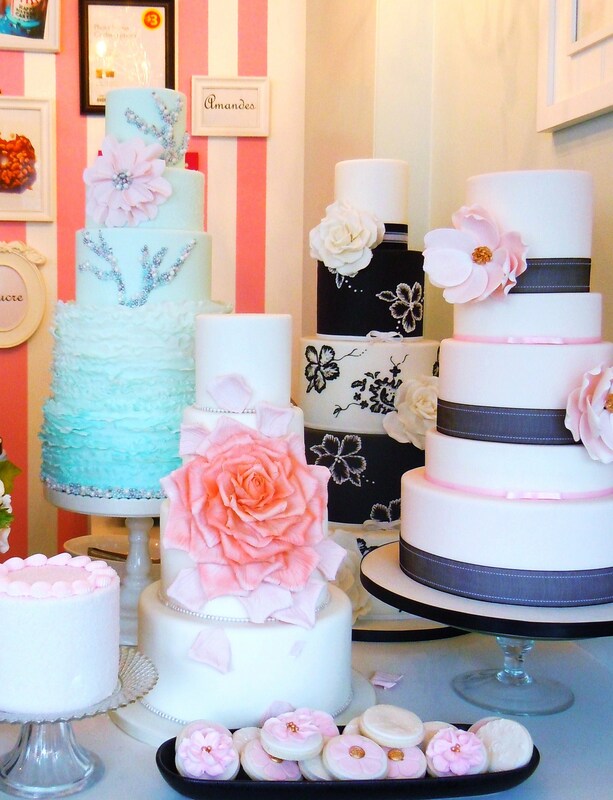 The sweet-as-pie shop is painted in pastel blue and pink-and-white stripes with bursts of sleek and modern black and white designs adorning their decorated cakes and beautiful framed watercolours of yummy desserts on the walls. 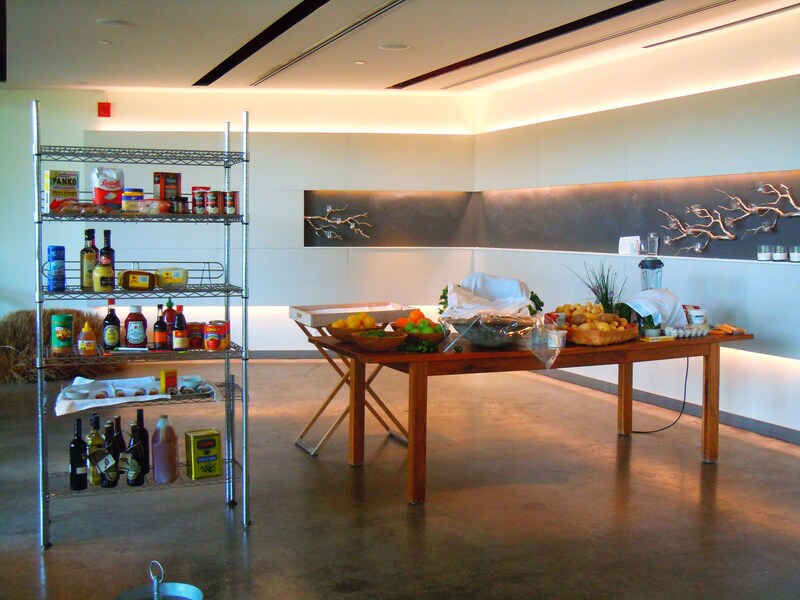 It’s a lovely space bursting with beauty and delicious things to eat. Macarons are $2.25 each with half a dozen coming in at $13 (tax inclusive) and a dozen at $25, also tax inclusive. On Macaron Day, 8 macaron flavours were on deck, ripe for the picking and patrons were allowed to choose any flavour of their choice as their free one so I chose their Flavour of the Month, Apricot Ginger with chocolate drizzle! In addition to my free macaron, I bought a dozen to take home with me (L to R): 2 each of their Yuzu, Blood Orange, Praline Crunch, Earl Grey, Guava, and Apricot Ginger. The only two flavours I didn’t choose were the Pistachio and Peanut and it certainly wasn’t because I didn’t want to! The peanut one sounded delicious, like a peanut butter cookie with creamy peanut butter filling or something and I’m always up for Pistachio but I wanted to try something different so I chose the flavours that were most different to me. Their macarons are so beautiful and colourful and yes, delicious! 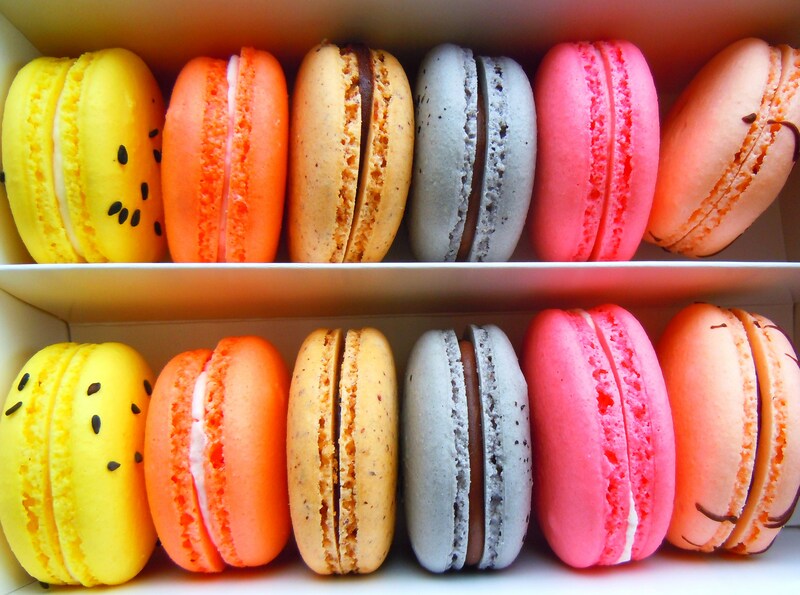 They’re about the size of a typical macaron (comparable to an Oreo cookie) and their fillings are mouthwateringly yummy. While I didn’t try all 6 flavours (remember I took these home for my family with the intent of sharing – I had to keep my word and save some for them!) I did try their Yuzu (the bright yellow with black sesame seeds), Guava (the lovely pinky-coral one), and Apricot Ginger with chocolate drizzle and I enjoyed them all. 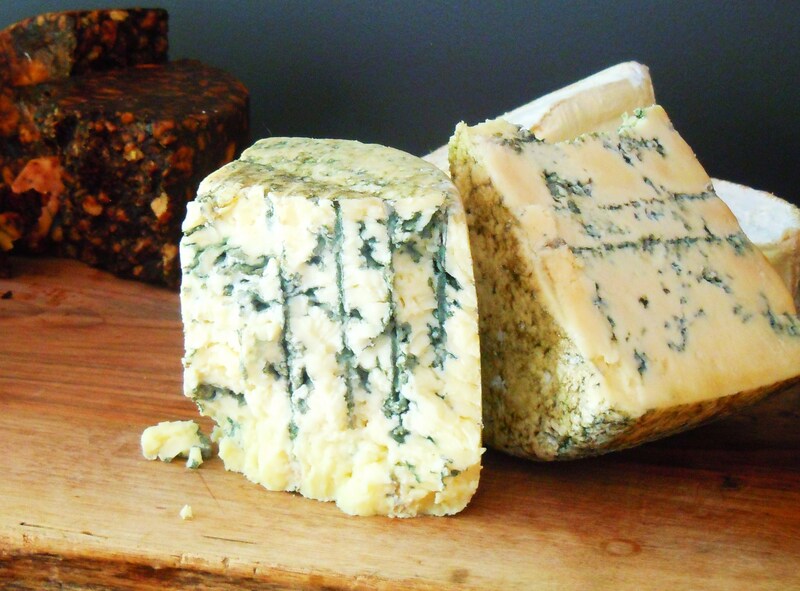 The fillings were light as air and so soft and creamy. If I had to choose a favourite I’d choose Guava simply because it’s extremely true to the fruit and also because it’s very unique. I haven’t come across another guava at any of the other patisseries thus far so it totally gets my vote! 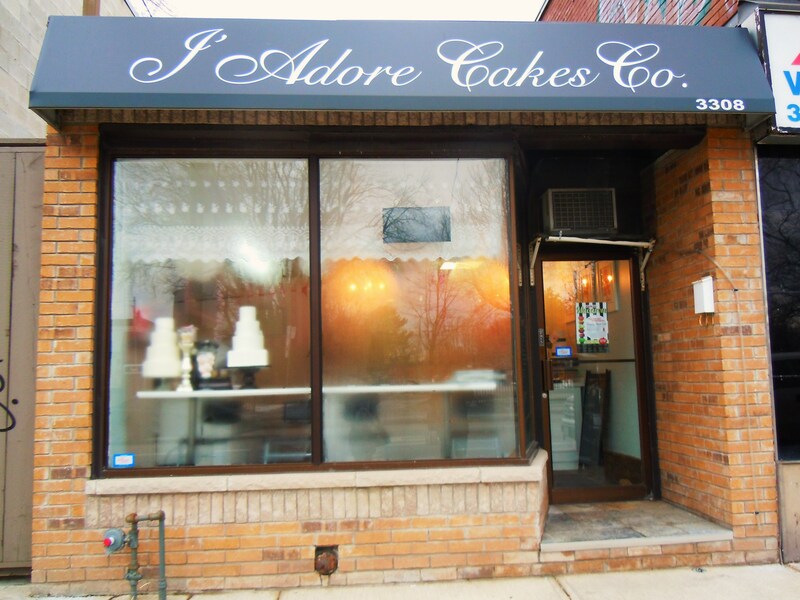 I can’t wait to go back to J’Adore Cakes & Co. for more macarons and to try their cupcakes and donuts. An honest-to-goodness sweet tooth like my self wouldn’t do justice if i didn’t! Macaron Day this year was extremely special. 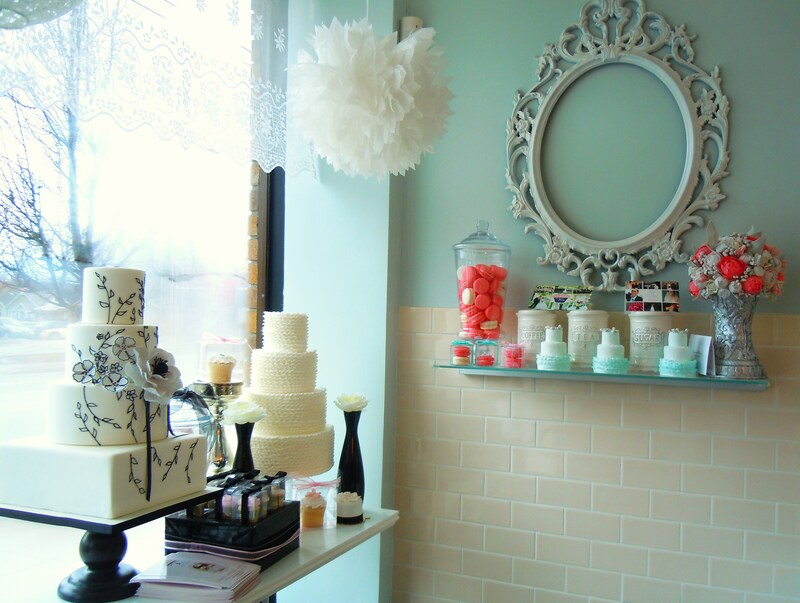 I got to visit a beautiful sweets boutique I had never been to before, I got to try a plethora of new flavours, and I got to enjoy the special day with my sweetheart. And you know what else? This Macaron Day enabled me to share my love and passion for macarons with my grandma on her birthday. 6 of those macarons were for her because I knew I’d be seeing her the next day and I wanted her to try these amazing sweets and to be a part of all the fun I had. Because of Macaron Day, I got to give my grandma her first macaron at the tender age of 81. And she loved it. 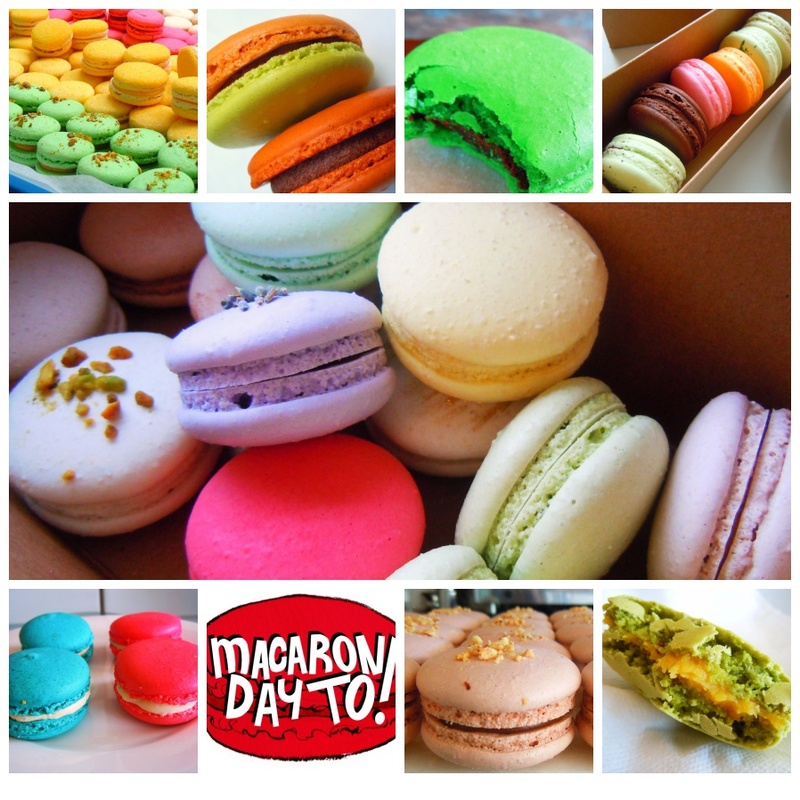 Map Out Your Macaron Munching Routes – 1 Week Until Macaron Day Toronto 2014! Just as the title says: only 1 more week until we celebrate the 3rd annual Macaron Day TO on March 20th! I’m happily volunteering again this year as a Macaron Day TO ambassador and I already have my macaron map figured out. 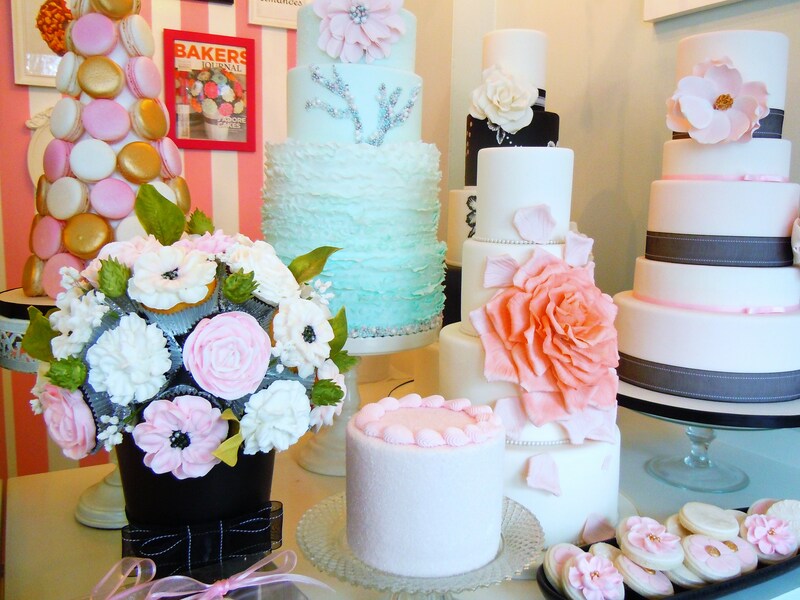 If you’ve never participated in the delicious occasion before, you must! Not only is it super fun carrying around a bundle of macarons in your arms (or purse or tote bag or in my case in the last two years, a picnic basket and Hello Kitty tin lunch box! ), it’s also for a bigger and more important cause. Macaron Day, in essence, is a day to support local charities in addition to enjoying delicious macarons and trying numerous wacky flavours made just for the occasion. Many cities take part including Paris, New York and Toronto and each city chooses a local charity to raise money for. For the last two years, Macaron Day TO has been donating 25% of all Macaron Day sales on March 20th to the Red Door Family Shelter, an organization that aids in providing care and social, legal and financial assistance to the homeless, low-income families and abused women and children just to name a handful. On March 20th, participating patisseries, bakeries and cafes all across the city will be baking up a storm in support of this cause. Here’s how it works: show up at a participating Macaron Day TO location, tell folks at said location that you’re celebrating Macaron Day and receive a FREE macaron! 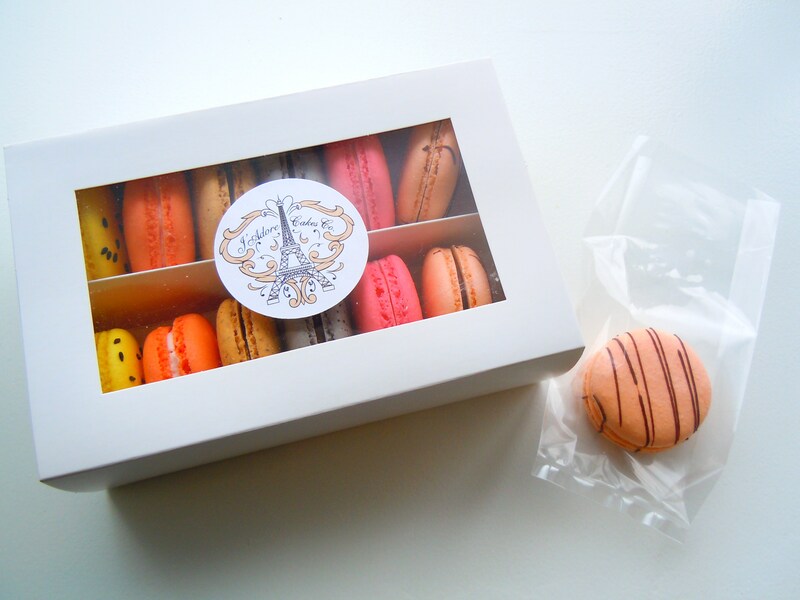 (One free macaron per customer). 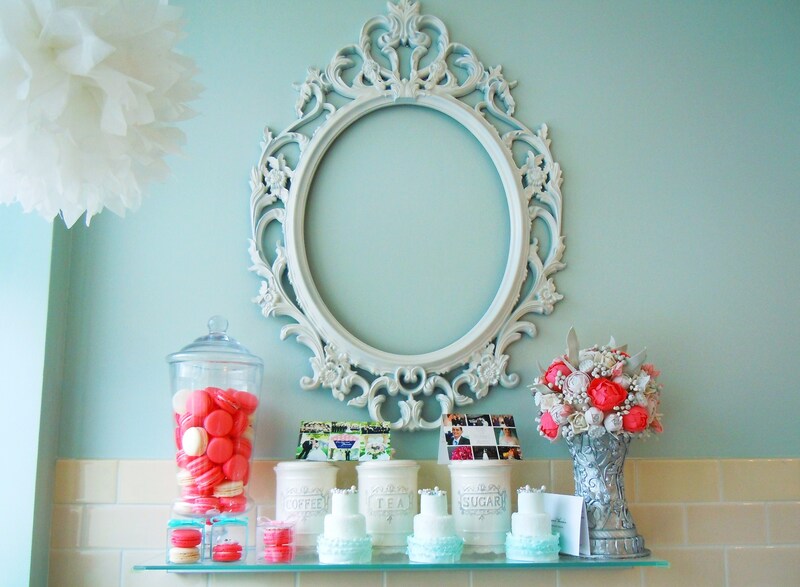 And of course, 25% of the proceeds of any and all macaron purchases you make on the day will go to benefit Red Door. Obviously, Macaron Day wouldn’t be a success without the enthusiasm and support from everyone who comes out for it, so if you can, visit your favourite participant or make a day out of like me! Get out early though as each participating location will have a limited number of free macarons to give out. I’ve had a lot of fun strategizing and mapping out my macaron munching routes the last two years and this year will be no different. I’ve generally followed a north-south plan, hitting up about 4 to 6 spots each year: La Bamboche, Petit Thuet x 2, Patachou, Rahier Patisserie, Patisserie La Cigogne, Yorkville Espresso Bar, and Daniel et Daniel. I’m going about my route a little differently this year so you’ll see lots of photos from places I haven’t hit on Macaron Day yet! I’m excited and I hope that all of you will get the chance to come out, have fun, eat macarons, and benefit Red Door. 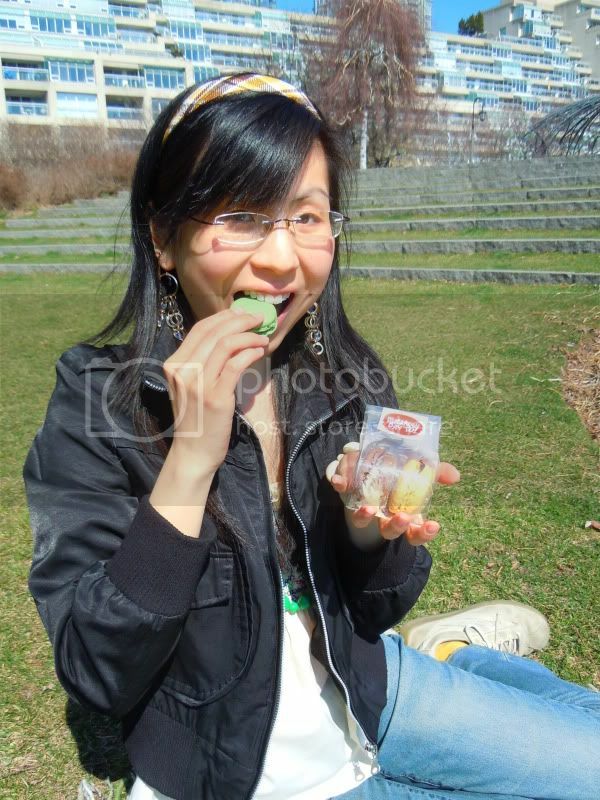 Check out all of Ate by Ate’s macaron yumminess! 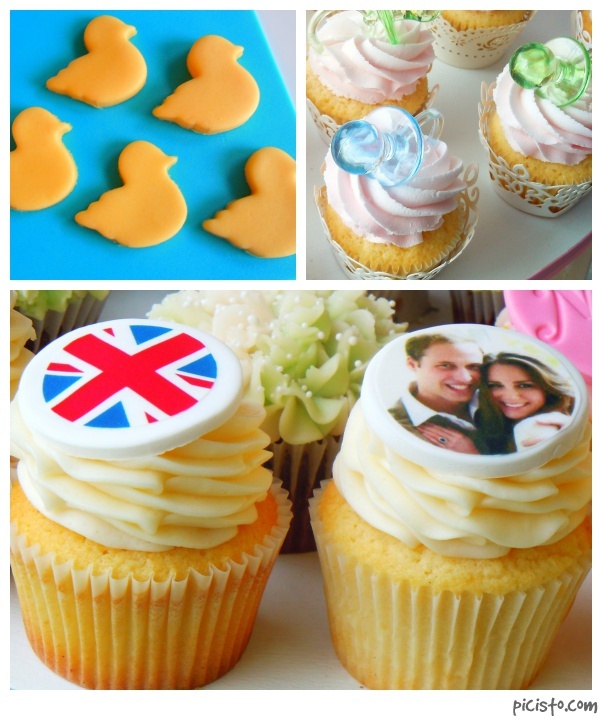 Welcoming the Royal Baby – Cupcake Hugs & Kisses to William & Kate’s Baby Boy! IT’S A BOY!!!! I can see we’ll be hearing and seeing that phrase a lot over the next 24 hours! So many people all over the world have been waiting with baited breath for the birth of William and Kate’s baby what with holding tea parties, royal-themed baby shower and dessert parties and more. And now their bundle of joy is finally here and for years to come so many of us will remember the day and where we were when we first heard the news (for the record, I was in a staff meeting where one of my coworkers scared the crap out of us with an excited shriek of, “IT’S A BOY!” after checking her phone). Time has passed us by in a fuzzy blur and I remember William and Kate’s wedding like it was yesterday when my boyfriend humoured me as I watched their nuptials on television 3 times. Sigh. While I’m by no means a tried-and-true royal family follower, this is such a happy time and I want to use this post to send my hugs and kisses and best wishes to William and Kate and their baby boy! 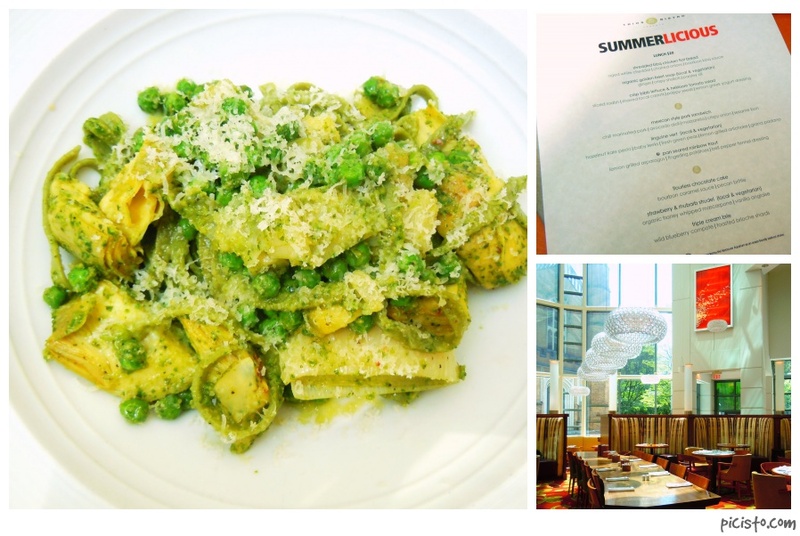 Kale Pesto & Artichoke Linguine, and Summer Strawberries, Rhubarb & Lettuces – Summerlicious at Trios Bistro! When was the last time you had a makes-me-wiggle-with-happiness meal? Mine was last Saturday. Okay maybe it was yesterday when I excitedly ordered a Chicken McNugget Happy Meal and got my adorable Despicable Me toy (shhh, that’s between us). But if we’re talking fine dining, it was Saturday. It was a beautiful day. A little on the hot and gross side, but a picture-perfect day nevertheless. 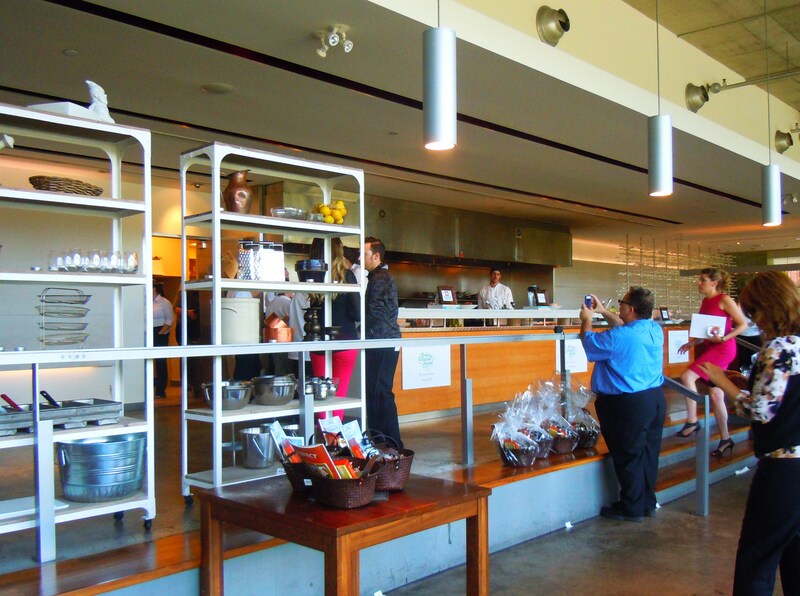 The seats were cushy, the place was gorgeous, and the food? Fantastic. One by one the dishes came: fresh and crunchy bibb lettuce, savoury artichokes bear-hugged by pesto and pasta and juicy berries in a flaky pastry surrounded by vanilla and whipped mascarpone. I sat back, relaxed, and breathed a sigh of relief as I savoured the first Summerlicious meal of the season and the first Summerlicious meal in two years! It’s about damn time Ate by Ate got back on the Summerlicious/Winterlicious wagon and believe me, this was no easy feat. You’d think that a girl who loves food as much as I do would be pirouetting around the city during an annual culinary event like Summerlicious, right? So wrong. 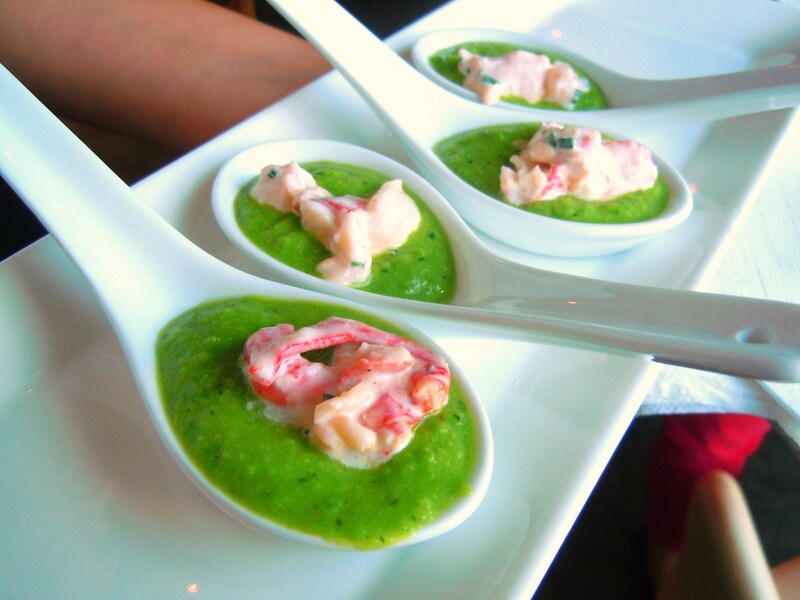 Summerlicious should be the highlight of the summer season for me. 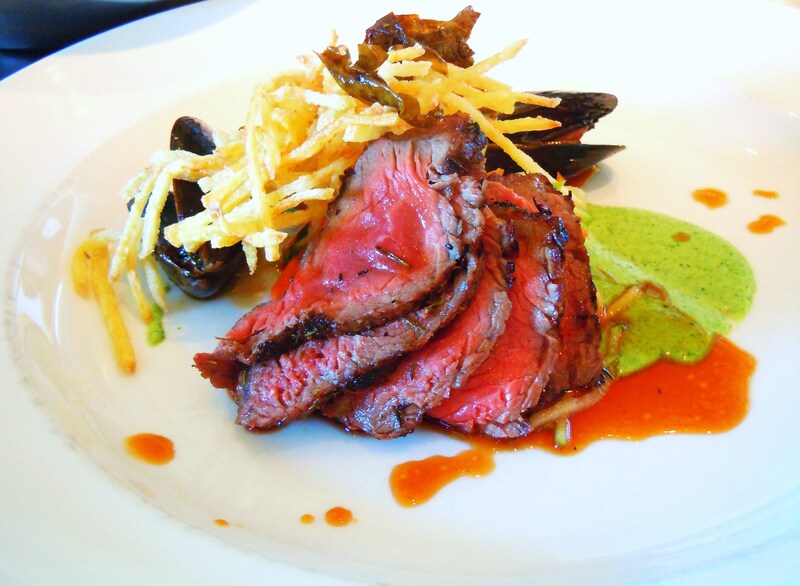 Over 100 restaurants with special price fixe menus, many of them bursting with seasonal yummies? You’d think that it was tailormade. But alas, it is not. And instead of looking forward to it, I almost dread it. I know, I’m talking crazy. I love Summerlicious in theory, in essence. In actuality? It drives me nuts. It’s any wonder I made it out for a meal this year because I was thisclose to bailing again. I gotta tell you, not only do I have a hard time choosing between menus and places (which really isn’t even the hardest thing about the event anymore; I’ve accepted the fact that I’m just a horribly indecisive person who hems and haws for eternity), but I have a really difficult time finding a place that serves Summerlicious lunch with a menu I can’t refuse during the weekend! I would love to do dinner, I really would. But when the bus service in your area ends ridiculously early for a Saturday night and your close-to-Union-Station options are, hence, more limited, you’re looking at Summerlicious lunch during the day as your best bet. So during my search, I kept clicking menu after menu after menu, double-checking with the actual restaurant sites to no avail. So many of the spots I wanted to try only served dinner on the weekend and it became so frustrating I wanted to throw in the towel and give up. 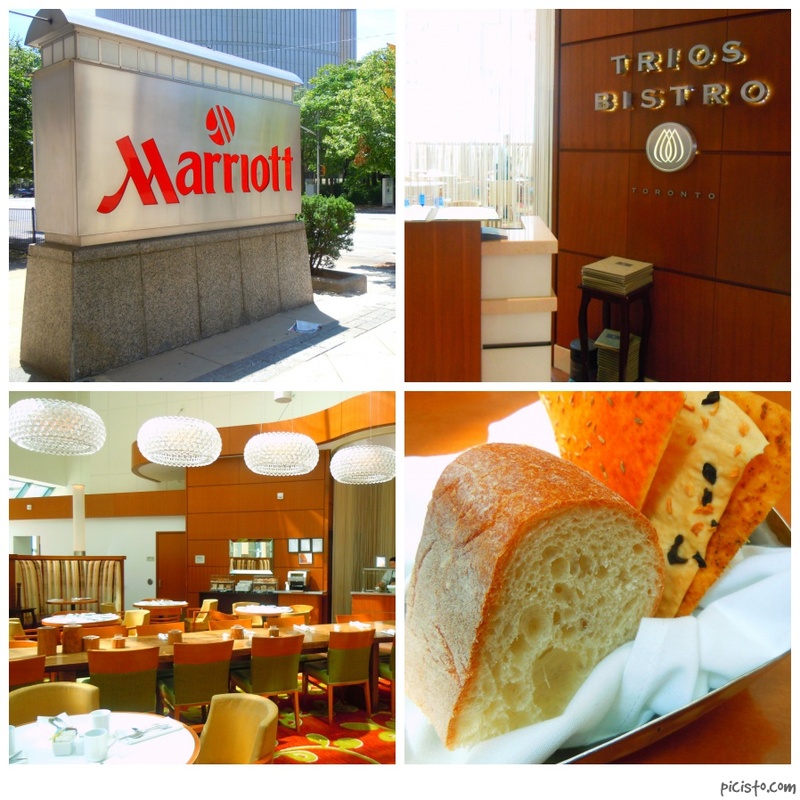 Then along came Trios Bistro at the Marriott. 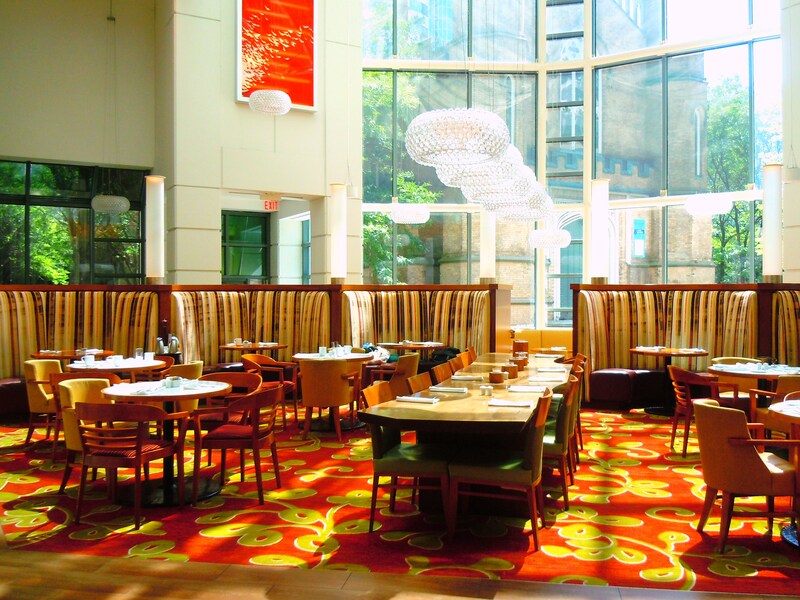 The beautiful Trios Bistro at the Marriott hotel by the Eaton Centre. It saved me. It saved me from banging my head against the wall and going 3 years without a Summerlicious adventure. Maybe it was meant to be. 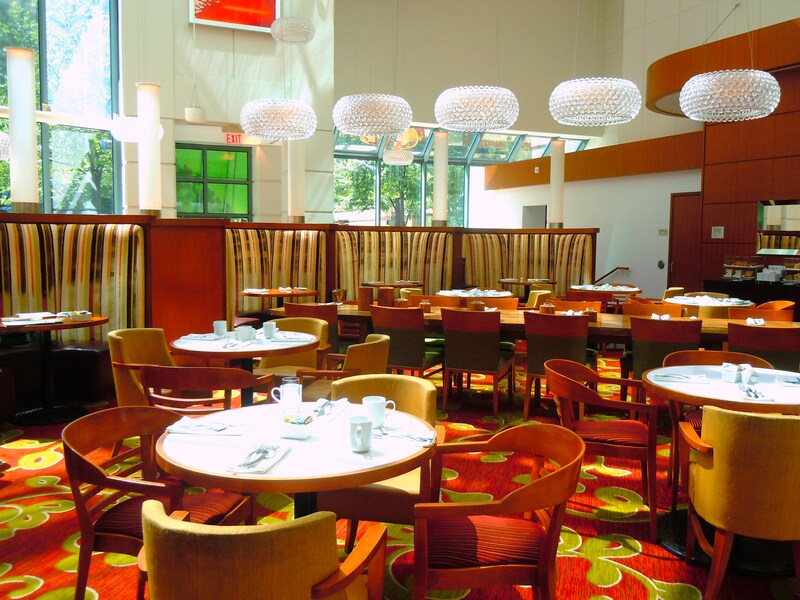 Trios Bistro at the Marriott is a beautiful space. 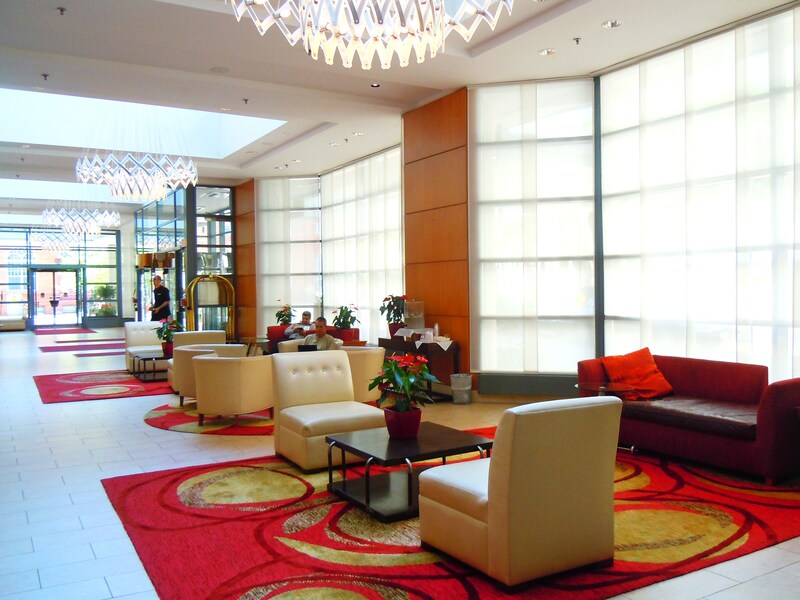 I’d even say a little on the majestic side with its high ceiling and windows overlooking Trinity Square, lush booth seating and carpeting, and pretty chandeliers. And it’s peaceful and relaxing. 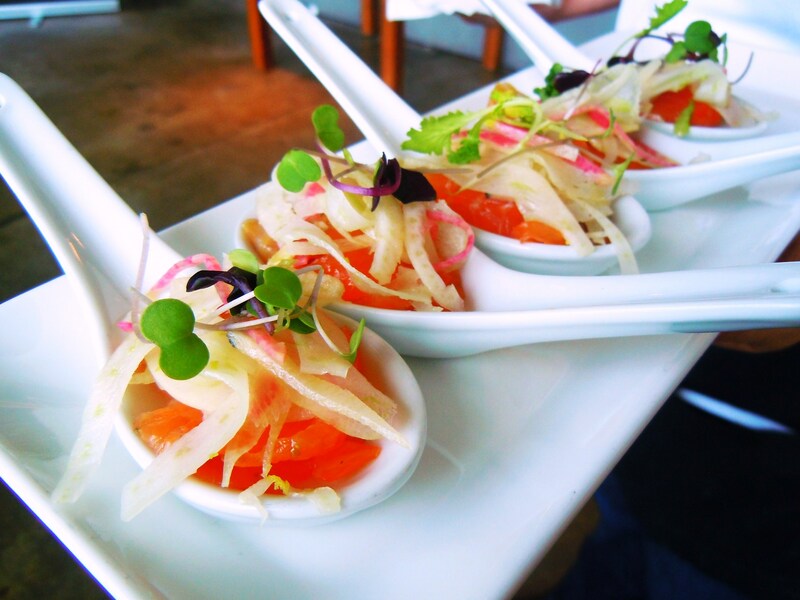 There’s no rushing; just delicious food in a lovely environment and atmosphere. 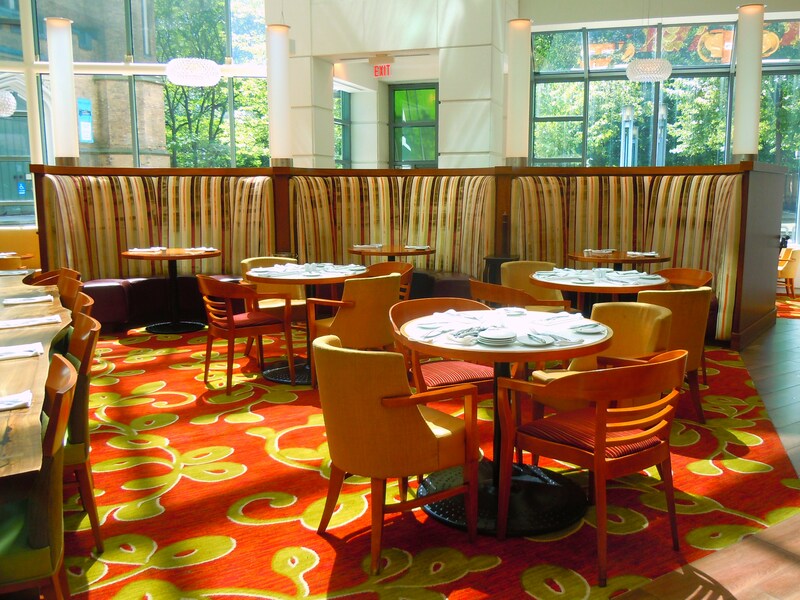 During normal, non Summerlicious and Winterlicious days, Trios serves breakfast, lunch and dinner and is open to the public and not just to hotel guests (SCORE!). Its proximity to the Eaton Centre and to the downtown core in general was perfect for me and it awesome being able to take advantage of a spot I’d never been to. Their Summerlicious price fixe lunch menu ($20) was perfect for both my boyfriend and I (anything with chocolate, chicken, and fish will satisfy the sweetie. Just, you know, not together. Oh and anything without tomatoes and onions as a option is a gold star bonus because he hates the stuff) and we both left happy and full with scrumptious food in our bellies. Here’s the Summerlicious menu lowdown: I chose their bibb lettuce and heirloom tomato salad as my appetizer (sliced radishes, shaved carrot, and lemon greek yogurt dressing), the linguine vert as my main (oodles of linguine noodles drenched in hazelnut kale pesto, artichokes, baby leeks, a mountain of peas and a smattering of grated grano padano cheese), and for dessert, a local strawberry and rhubarb strudel pastry with berries and glaze, whipped mascarpone and vanilla cream. Everything was so simple but so HUGE on flavour. This was such a fantastic meal and I feel like I got my money’s worth and than some. I was so happy with the portions (the doggy-bagger in me was absolutely thrilled that I ate everything and didn’t need to take anything away in the sweltering heat! I am not a fan of wasting food on my plate) and as soon as I took the first bite of my food, I KNEW I had made the right choice to come here for Summerlicious. The last thing anyone wants is to blow that amount of money on a crappy meal! There were so many highlights: even with the dressing the bibb lettuce was so crisp and fresh, the tomatoes were ridiculously juicy and the dressing. OH.MY.GOD. It tasted divine. 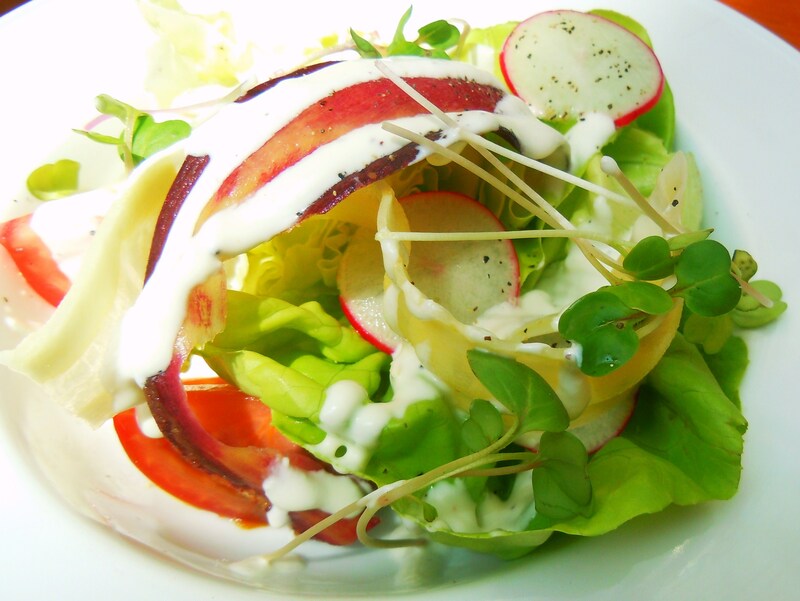 It tasted like this crazy marriage between yogurt dressing and rich buttermilk! It was so fragrant and the aroma of it literally beckoned me to the salad bowl. I mean, I was uber hungry to begin with but this just tipped the scales. 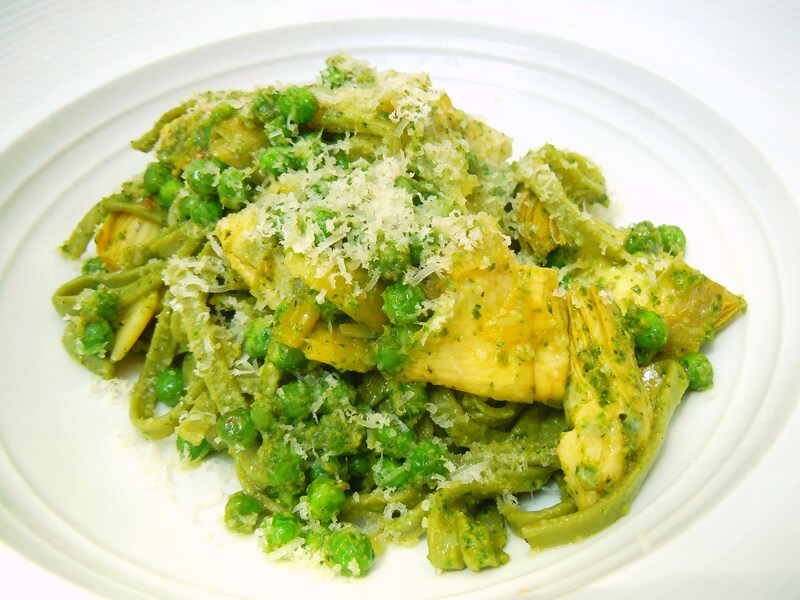 The pasta was perfectly cooked with just the right amount of pesto and olive oil sauce and the artichoke chunks were ginormous and delicious! 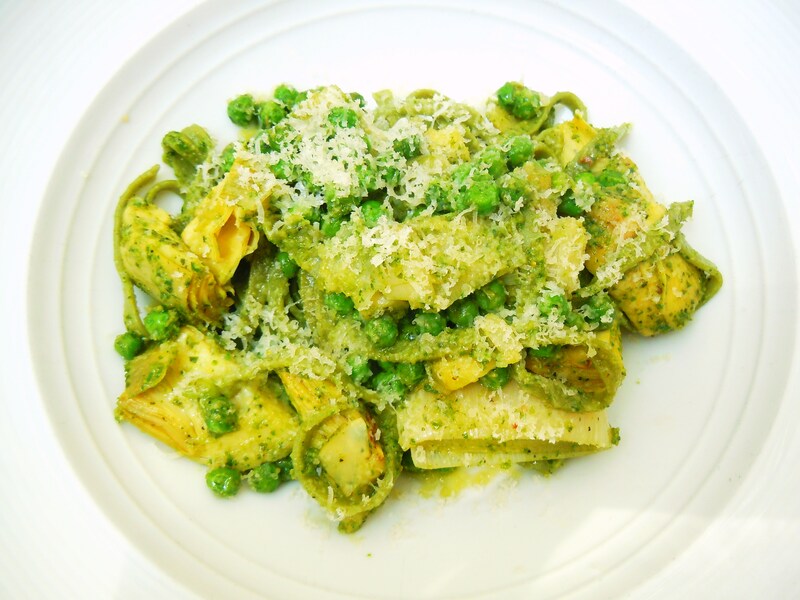 It was perfect for me because I love pasta like nobody’s business and it incorporated both things I love and eat regularly (peas and pesto!) with things I don’t eat regularly like leeks and artichokes. This dish was a gift that just kept on giving with all its flavour and texture. 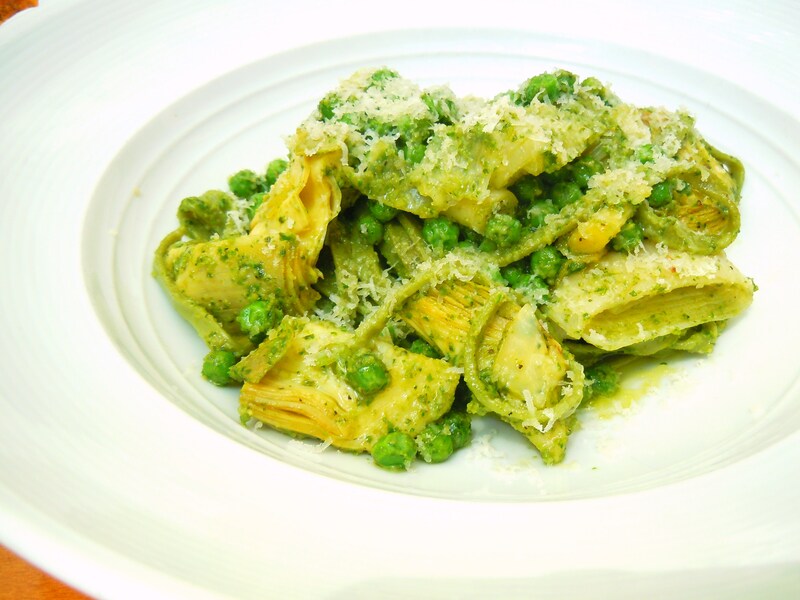 You had that little bit of starchiness from the peas, the juicy, savouriness from the artichokes, the freshness and nuttiness from the pesto and the smooth, velvetyness of the linguine noodles. 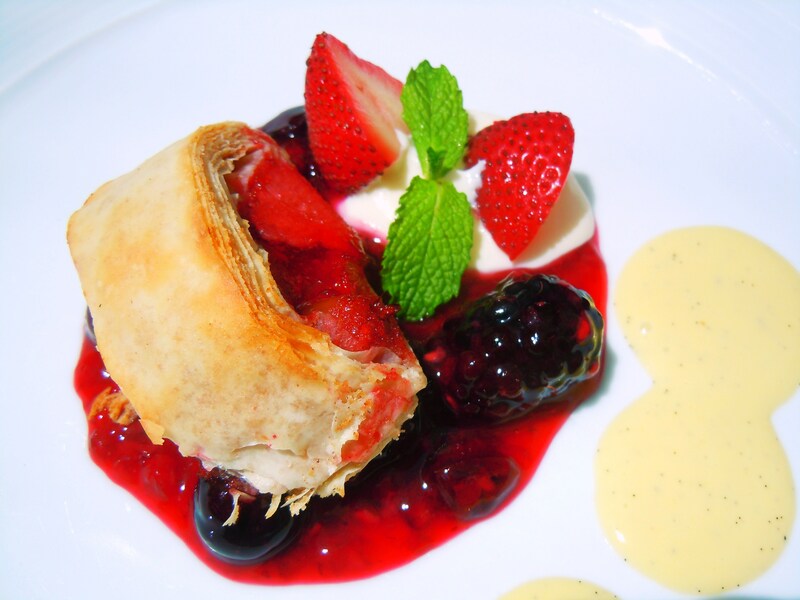 And then the finale: the strawberry-rhubarb strudel! I was so happy that I could actually savoury the rhubarb. I know this sounds stupid, but let’s be frank: some places would probably err on the side of strawberry with just a hint of rhubarb. Not at Trios. 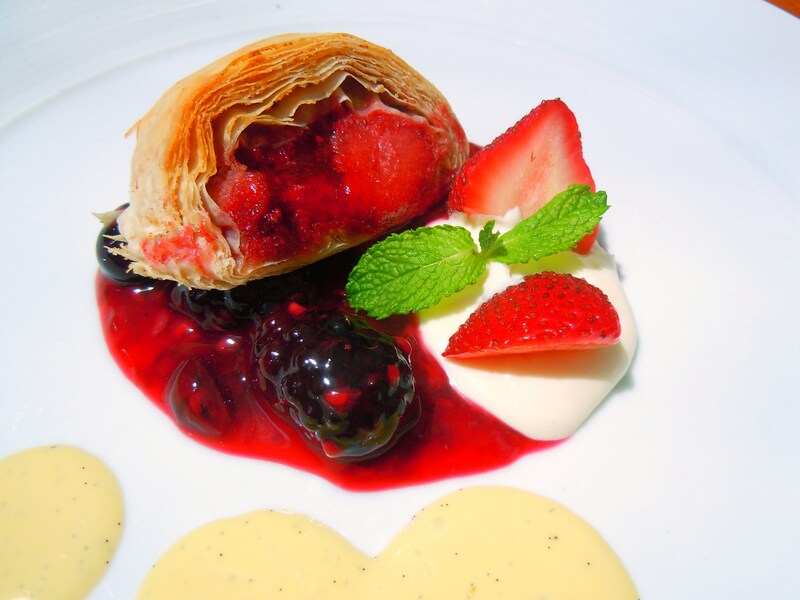 Every mouthful was crispy paper-thin layers of pastry sprinkled with sugar (it wasn’t soggy and it wasn’t stodgy) with juicy berries and sweet whipped mascarpone and vanilla sauce. 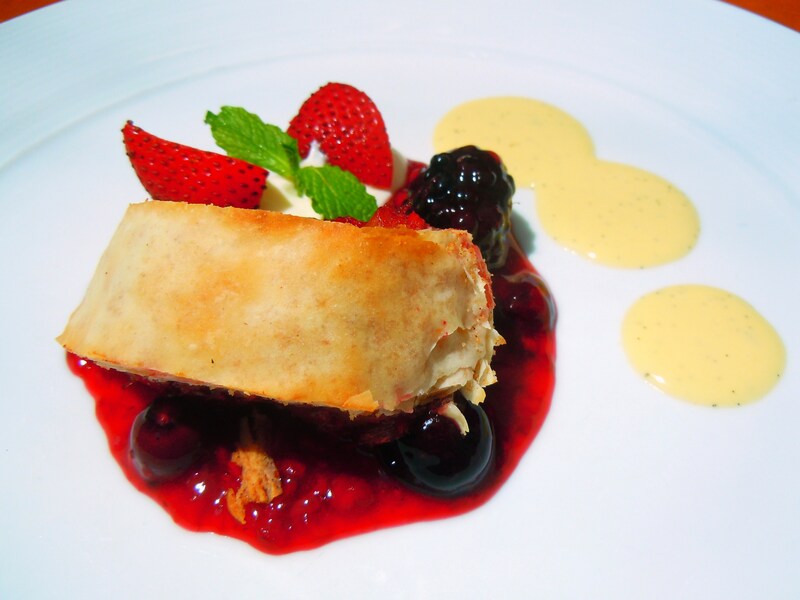 It was great because even though it was a strudel there was plenty of surface area to soak up the vanilla and cream and there was a great balance between sweetness and summer berry tartness. I am so relieved this Summerlicious meal worked out and while it wasn’t anything necessarily out of my comfort zone, I still got to enjoy many foods that I don’t eat often and for that, it was well worth it on its own. Because Summerlicious isn’t just about taking risks and trying foods completely out of your element at a discounted rate; it’s about finding that perfect food match that makes a meal memorable from top to bottom. And I’m so happy Trios Bistro could make that happen for me this time around. 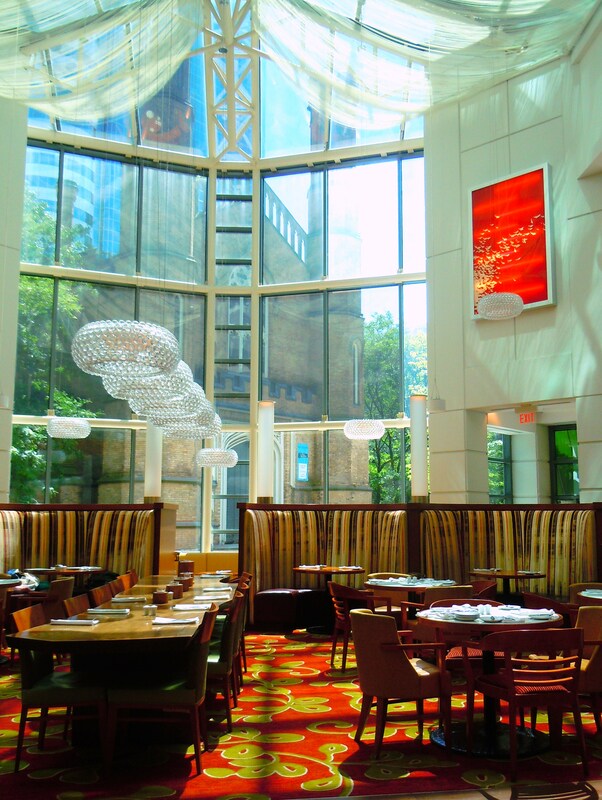 Trios Bistros is located at 525 Bay Street at the Toronto Eaton Centre Marriott Hotel in downtown Toronto just south of Dundas Street West. 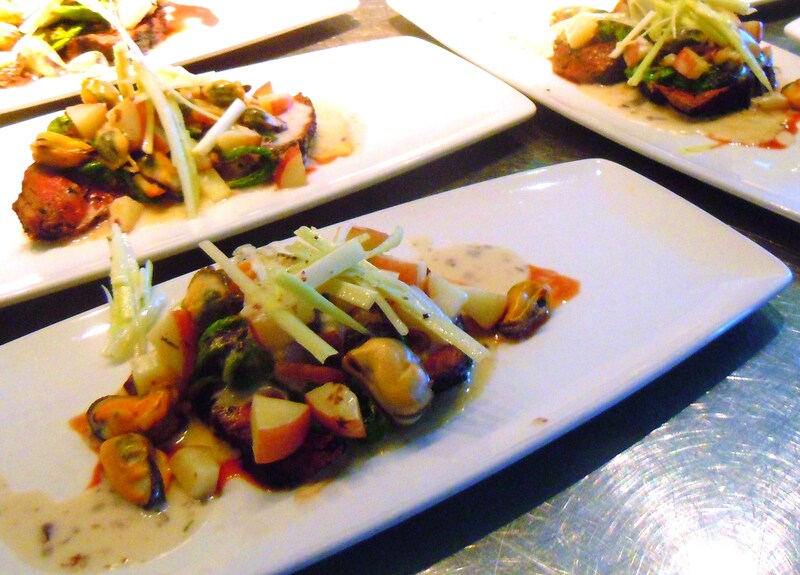 You can follow them on Twitter @TriosBistro and you can check out their Summerlicious menus and their regular menus HERE. 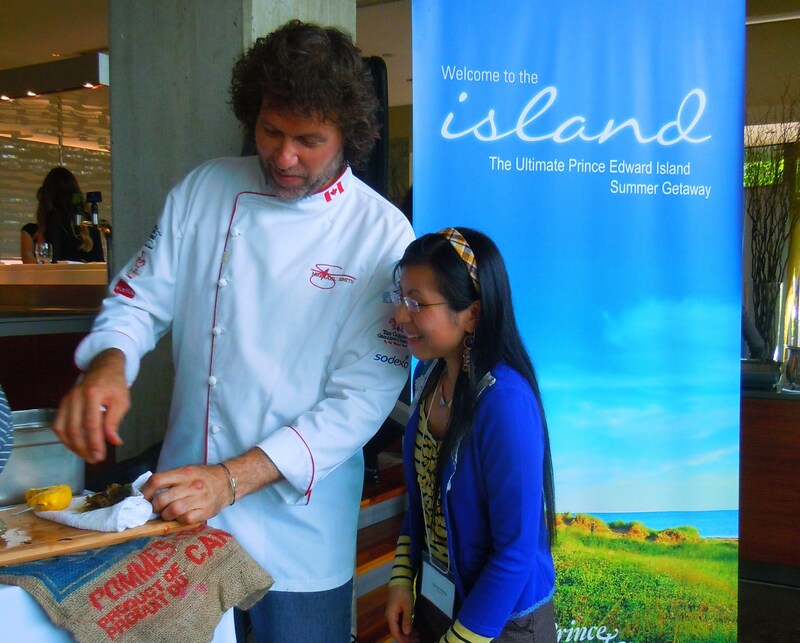 Eat, Cook, Love – Beef, Mussels, Foraged Foods & the Taste of PEI Cook-Off Challenge with Michael Smith, Part II! Hot beef being sliced, sauce being drizzled, potatoes being mashed and hands and arms flailing in a flurry of activity. It’s not every day you get to be smack-dab in the middle of a live cooking challenge, much less one hosted by Chef Michael Smith! 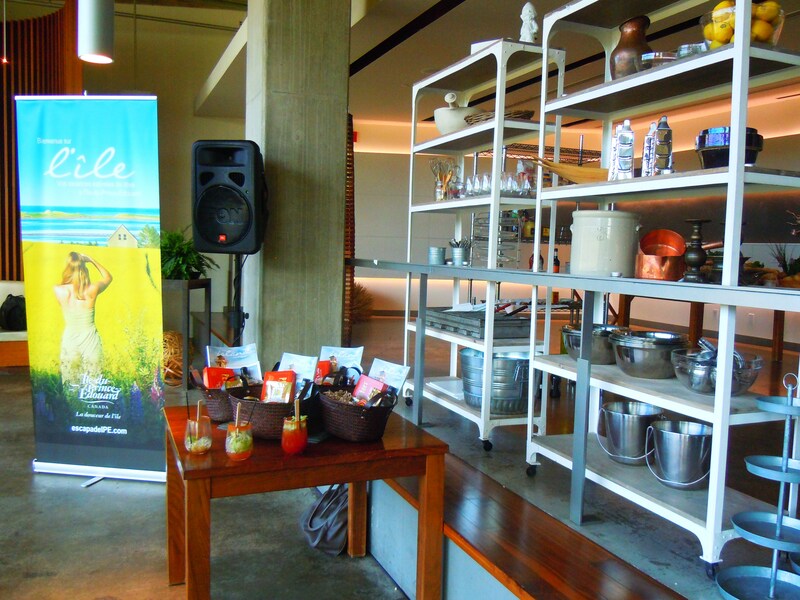 This is Part II of The Taste of PEI Cook-Off Challenge event where I dined on and soaked in everything Prince Edward Island at Mildred’s Temple Kitchen in Liberty Village several weeks ago! This was so much fun because not only did all of us get to take part in some fun oyster eating and shucking demos, eat Prince Edward Island food, and meet and mingle with fellow food bloggers, travel foodies, and industry folk, we also got the opportunity to get up close and personal with the crazy half hour cooking battle that took place during the event: 4 chefs, 4 appetizers on 4 plates, 4 “secret” ingredients and one hell of an exciting cook-off! Now I know it sounds a little strange that I’m saying that we got take part in the cooking challenge. 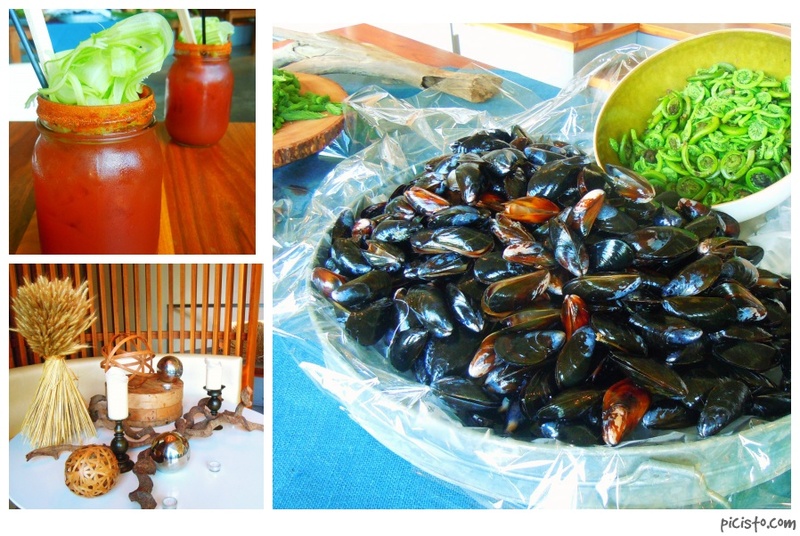 After all, the event was called the Taste of PEI Cook-Off Challenge for a reason; we certainly weren’t just there to nosh on platters of cheese and veggies and PEI meats and seafood! 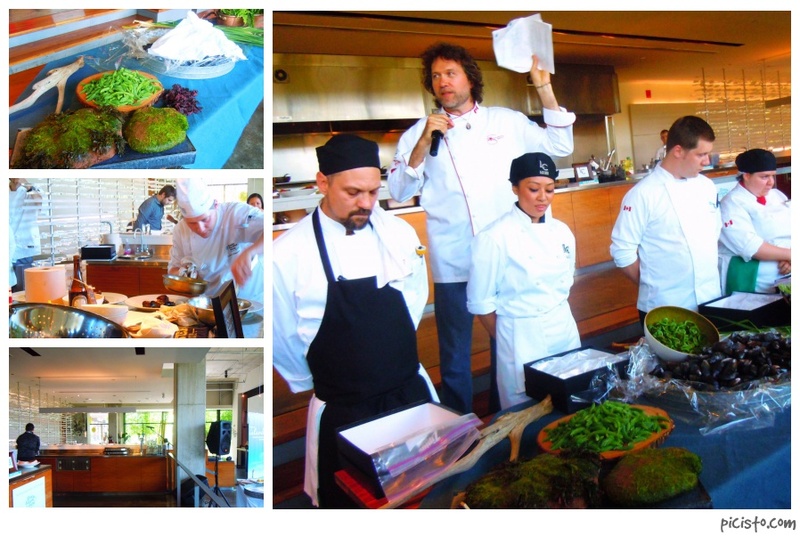 There were many things to take away from the event but clearly, the cook-off was the jewel of the treasure chest. However, there’s a big difference between being a spectator and being right in the middle of the action soaking everything in as its happening. And that is why this event, in my opinion, was so much fun, so well-executed, and so meaningful for everyone involved. 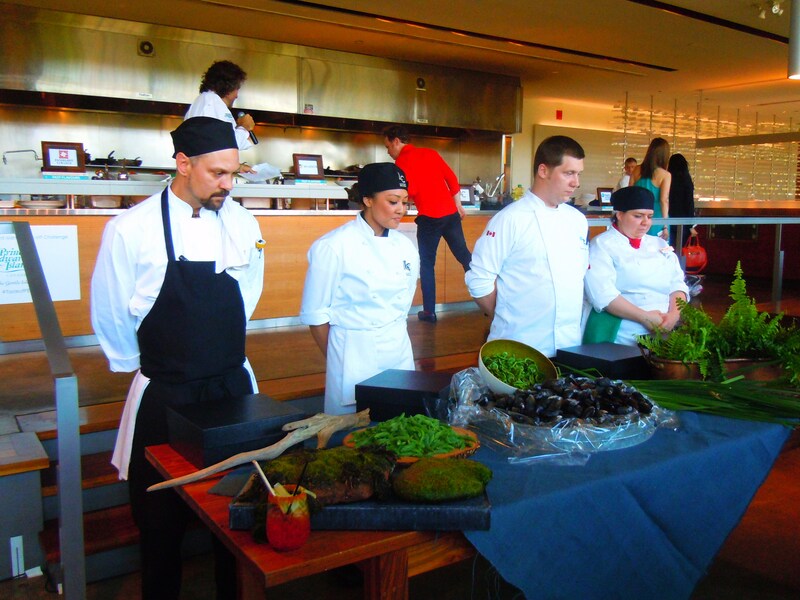 It wasn’t just us standing around looking on while the 4 competing chefs cooked. 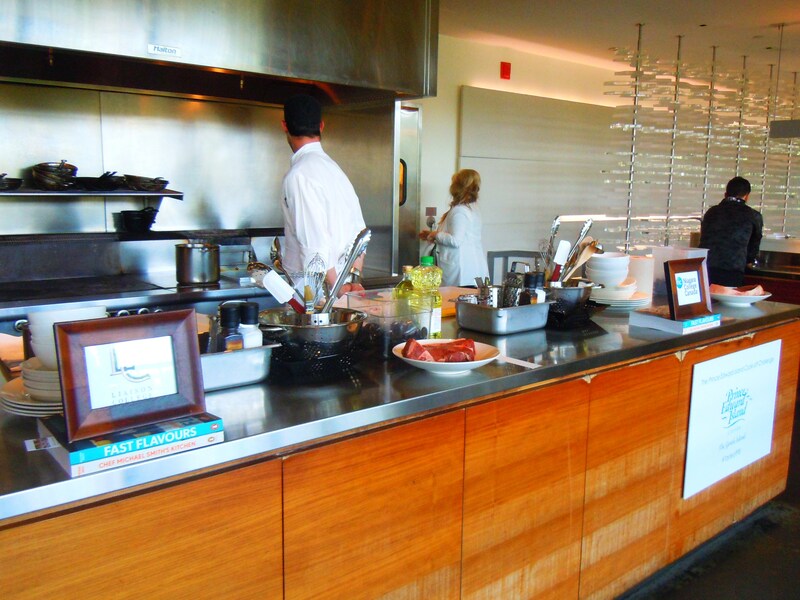 We were all allowed to walk right up to the cooking station where all 4 chefs were preparing their dishes (so long as we didn’t interfere and get in their way of course! ), ask questions, take an obscene amount of photos, record videos, and basically salivate and gawk as we did it. 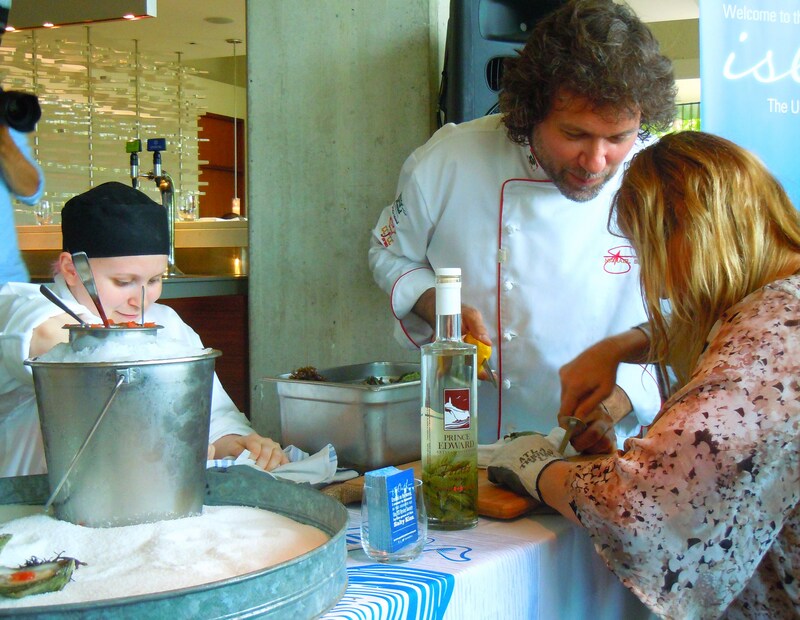 It was such a warm, welcoming, open atmosphere and we were all made to feel like the event was for us just as much as it was for the chefs, for the media and for the organizers. It was such a treat and much more interactive than I thought it would be! 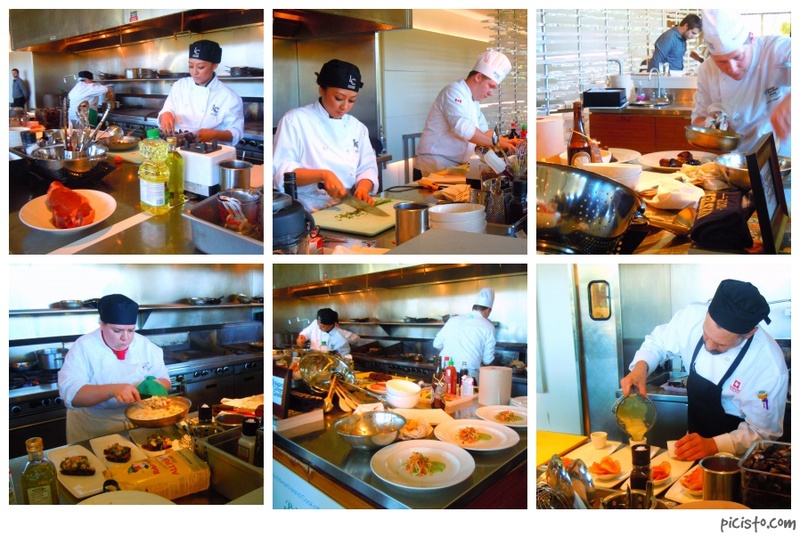 We were standing there recording their every move in image and video and none of the 4 chefs missed a beat, like they were made to compete and to showcase their culinary talents in front of an adoring crowd. And I do mean every move! We were literally speed-walking and jogging back and forth between chefs snapping photos and it’s almost ridiculous everything we recorded: “Ooo, he put sauce on the plate!” *CLICK* “Ooo, she’s slicing the beef!” *CLICK* “Check out those waffle chips!” *CLICK* “Did someone drop something? !” *CLI-okay, maybe not* You get the idea. It was all part of the experience and I’m really grateful that we weren’t given the red tape or the boot to stay clear. 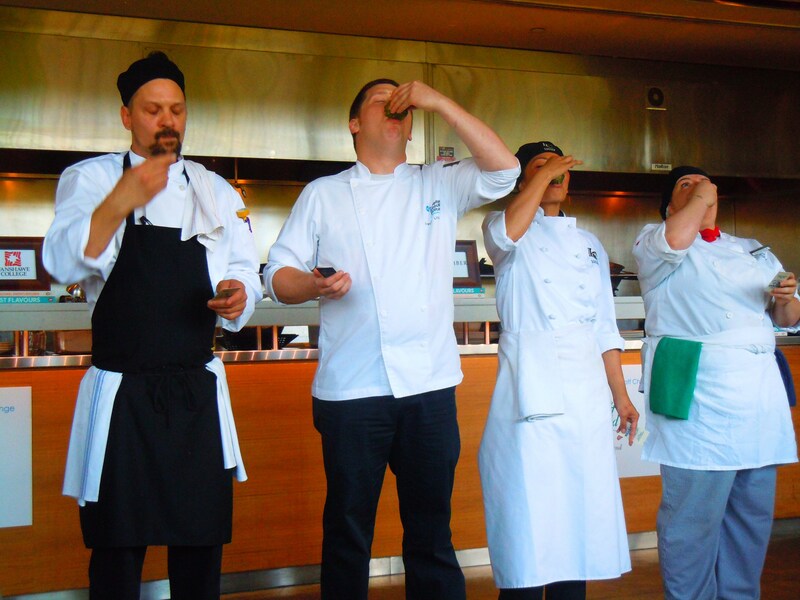 The chefs taking the “Oyster Oath” before competition! The 4 wonderful chefs and aspiring culinary giants that took part in the PEI cook-off challenge were Keith Hubbard from Fanshawe College (far left), Trevor Littlejohn from Niagara College (2nd from the right), Chrystalla Papachristou from Humber College (far right), and the cooking challenge winner that night, Lorelei Simbulan (2nd from the left) from Liasion College! The task? 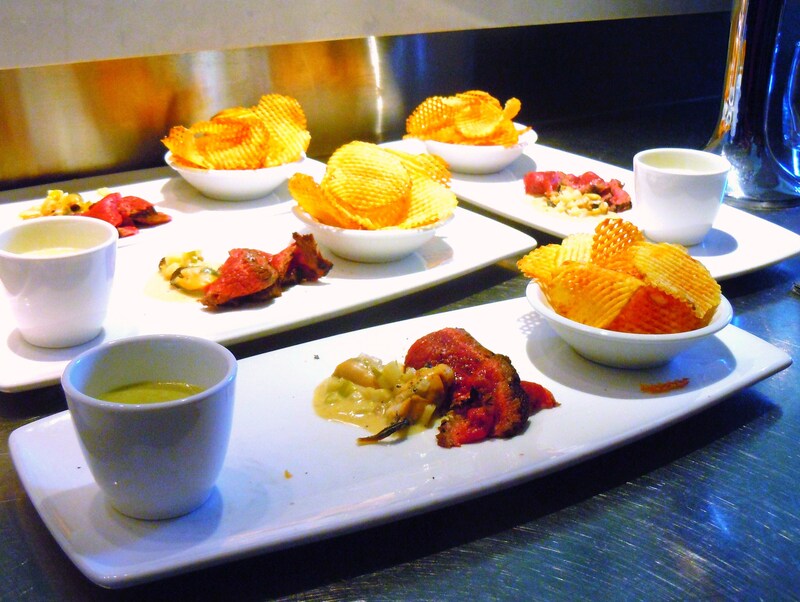 To create ONE appetizer dish FOUR times for four plates using PEI ingredients (mussels, beef, potatoes, etc.) AND to incorporate at least ONE of the FOUR “secret” PEI foraged ingredients! 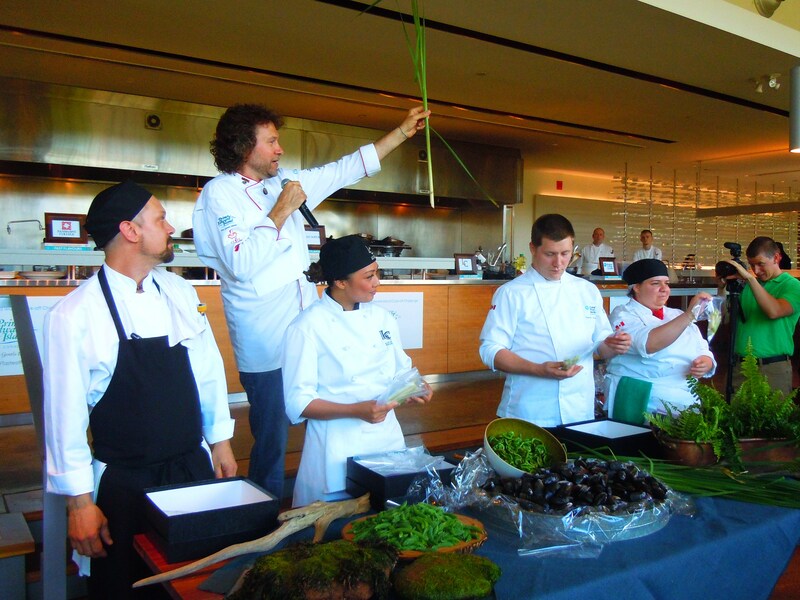 The four foraged ingredients (cattails, mussels, fiddleheards and spruce shoots) are foods that really make Prince Edward Island shine and they were all personally foraged by Michael Smith for this very event. The event was about cooking and eating and the love of food, yes, but also about doing things out of your comfort zone, opening yourself up to new experiences, and to really become one with your food in whatever way that you can. And Michael Smith does this by foraging for wild ingredients and harvesting them, getting the hands and feet dirty (literally putting on those wellies and sticking your hands into a swampy area and grabbing those cattails out!) and learning about what your hometown has to offer. Because little do we know, food could be staring us in the face in our own neighourhoods; we just have to find ways to explore, research and get to know the food possibilities that surround us. 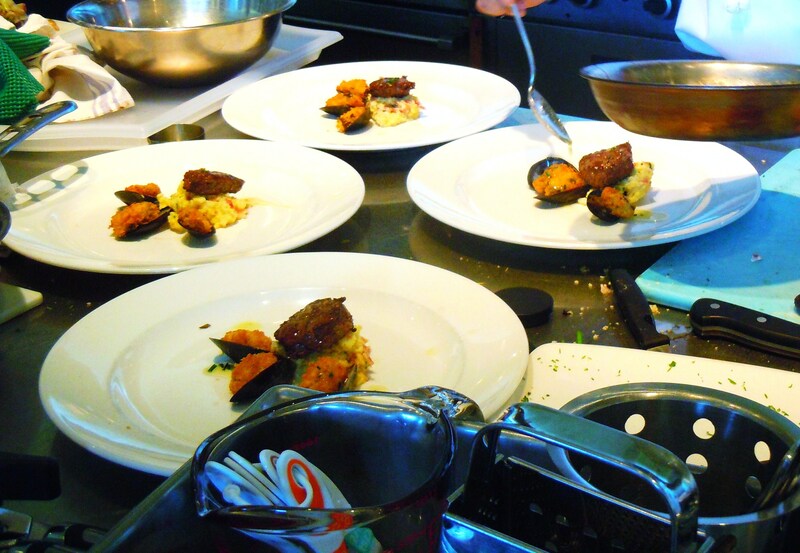 The chefs had 30 minutes to prepare their appetizers on 4 plates using whatever was available to them in the kitchen “pantry” (SO totally Chopped-like on Food Network with the secret ingredients, stocked pantry, and sweaty countdown to the finish line!) and in the end, they would be judged by Michael Smith and 3 selected judges and a winner would be crowned with a prize of $500 and bragging rights! We watched the cook-off from start to finish from the moment the chefs raced to the pantry shelves and table to the last seconds of plating. And in the end, not one chef make an appetizer that was similar to anybody else’s. Keith went, in my mind, the chic pub-style, comfort food route with a grilled strip loin with apple cider vinegar and smashed garlic served with fiddlehead, spruce shoots and potato soup, apple and blue cheese mussels and crispy waffle chips* (I am such a sucker for waffle chips, they are just so darn cute! ); Trevor‘s dish oozed steakhouse gourmet with a sesame grilled strip loin (seeing those slices of of strip loin made me drool, oh my gosh) with spruce shoots and Sriracha served with a fiddlehead and potato puree, carrot and green apple citrus slaw with bacon, sticky soy and beer braised mussels and topped with dulse potato hickory sticks*. Chrystalla went contemporary with lots of fruity, flavourfuls twists with a grilled strip loin steak marinated with spruce shoots and grape seed oil served with fiddleheads sweetened with honey, orange juice and orange zest and potatoes sautéed with mussels, coconut milk, a hint of cream and dulse, garnished with cattails marinated in white wine vinegar and grape seed oil* (truly like a mosaic of edible art! ); and finally, Lorelei’s was a petite “big things come in small packages” warmth and comfort of a delight: pan seared medallion of beef seasoned with salt, pepper and spruce shoots served over Dijon and chive mashed potatoes with Panko and dusle mussels and a garlic butter sauce* (which just about made my stomach growl!). 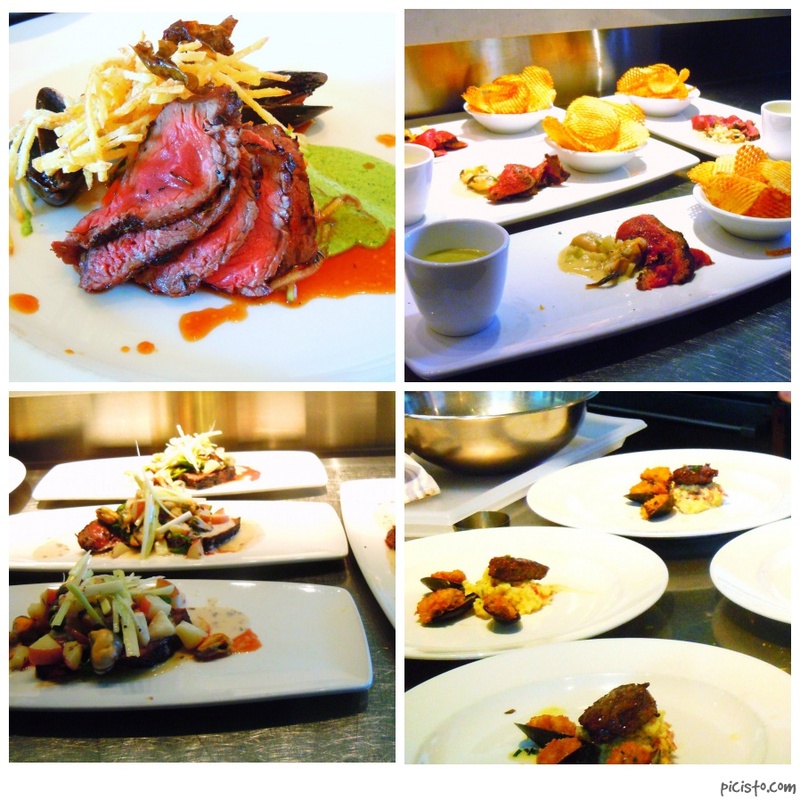 So many different interpretations and styles and yet they all worked together as one cohesive food presentation. After careful deliberation, Lorelei Simbulan from Liasion College was crowned winner of the Taste of PEI Cook-Off Challenge with a big fat cheque of $500 to take home! Watching the 4 chefs duke it out Chopped and Iron Chef-style was incredible (no easy feat to plate the same dish 4 times and to keep things consistent! I can’t tell you how many times I’ve watched Chopped or The Next Iron Chef or something or other and one judge will love it and another will say, “um, mine was undercooked!”) and it was such a fun, eye-opening experience to see them push their creative minds for the love and passion of food and cooking. 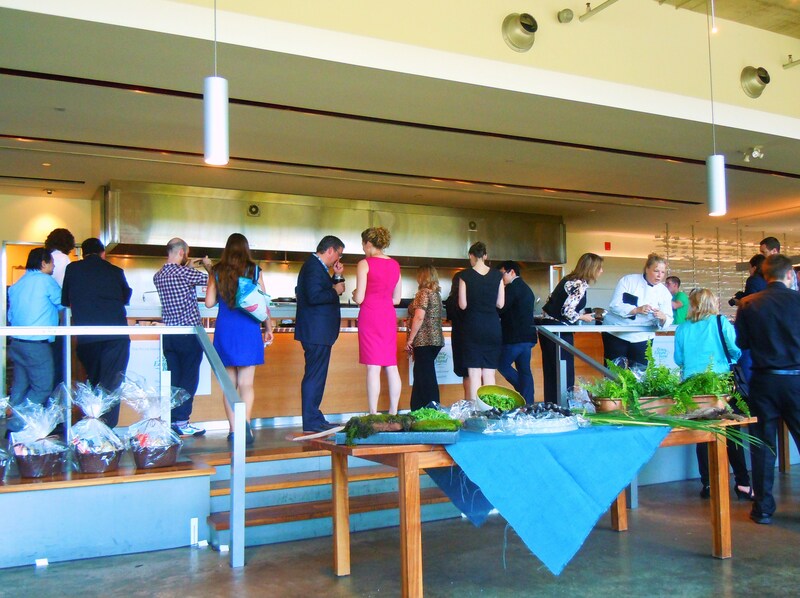 A HUGE thanks to Tourism PEI and Mosaic for organizing the event (*and for providing us bloggers with all the nitty gritty details of all the ingredients that went into the chefs’ final dishes! ), to Mildred’s Temple Kitchen for providing their beautiful space for the event, to all the great people I met that night (shoutouts go out to Alex Ward from Fresh Juice, Dave and Deb (my name twin!) 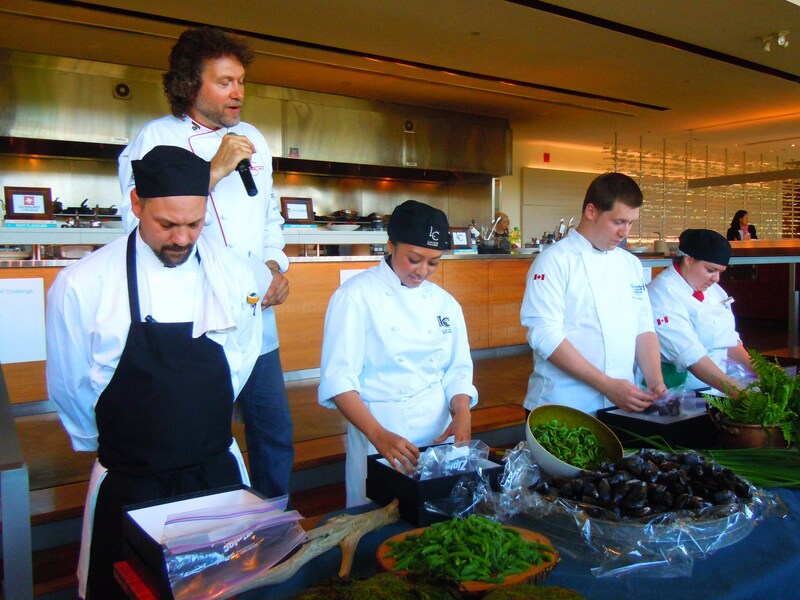 at ThePlanetD, Brian @ProjectBLT and The Huffington Post, and Foodies Inked) and to Chef Micheal Smith for hosting, brining PEI to TO and for being an inspiration all these years. My dear beloved Anne of Green Gables took the words right out of my mouth. Oh, the delights of anticipation. Three weeks ago (yes, it’s been 3 weeks already! ), I was given the opportunity to attend a very special Taste of PEI and PEI Cook-Off Challenge event organized by Tourism PEI and Mosaic Sales Solutions and Marketing that took place at Mildred’s Temple Kitchen in Liberty Village, a beautiful space with massive windows (we food bloggers salivate like hungry bloodhounds over natural light like this! 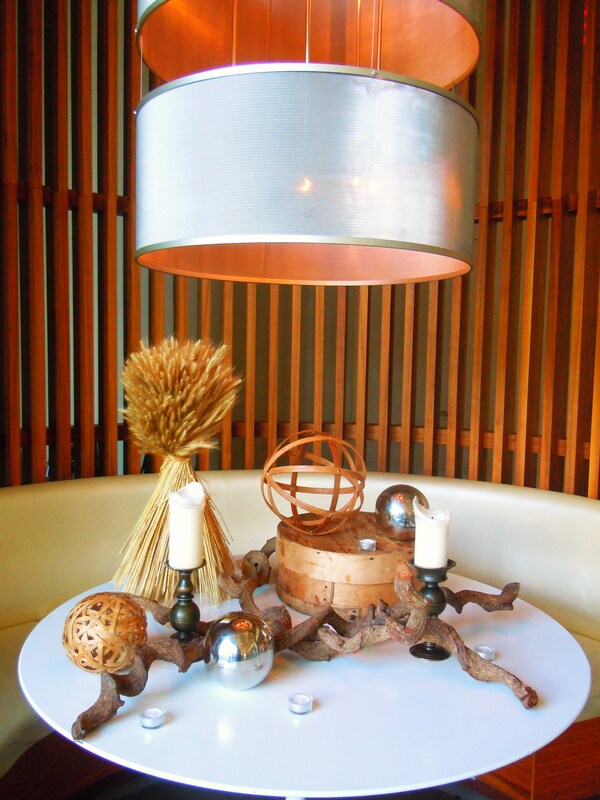 ), circular booths and tables conducive to group socializing and mingling and an open kitchen perfect for 4 aspiring chefs to showcase their culinary prowess in front of a loving food crowd. It was about bringing together the love of food with a love of PEI and all it has to offer, trying new things, learning new things, breathing in new experiences, meeting new people and shining a spotlight on 4 chefs from 4 different colleges competing against one another in a PEI-themed cook-off challenge Chopped style: 4 chefs, 4 appetizers, 4 secret ingredients in 4 boxes for one grand prize at the end of the night: $500 and of course, bragging rights! Oh. And did I mention the event was being hosted by Michael Smith? MICHAEL SMITH. MICHAEL SMITH! And that I got to shake his hand, gush about how much I loved watching Chef at Home on Food Network, eat my very first oyster off the shell in his very presence while he showed me and everyone else how oysters are shucked and have him sign my special Food Network Canada 10th anniversary magazine with him on the cover? Thinking about it makes me want to cry. And just like Anne, come hell or high water I was going to make it to this event. No disgusting weather or nasty migraine was going to keep me away. Many events and invitations come in and out of our lives but when the perfect one comes around and you just feel it in your heart that it’s going to be amazing, you don’t let the opportunity slip through your fingers. I had no idea what to expect before I came though and, looking back, it’s remarkable how much we were able to pack into a 3 hour event! 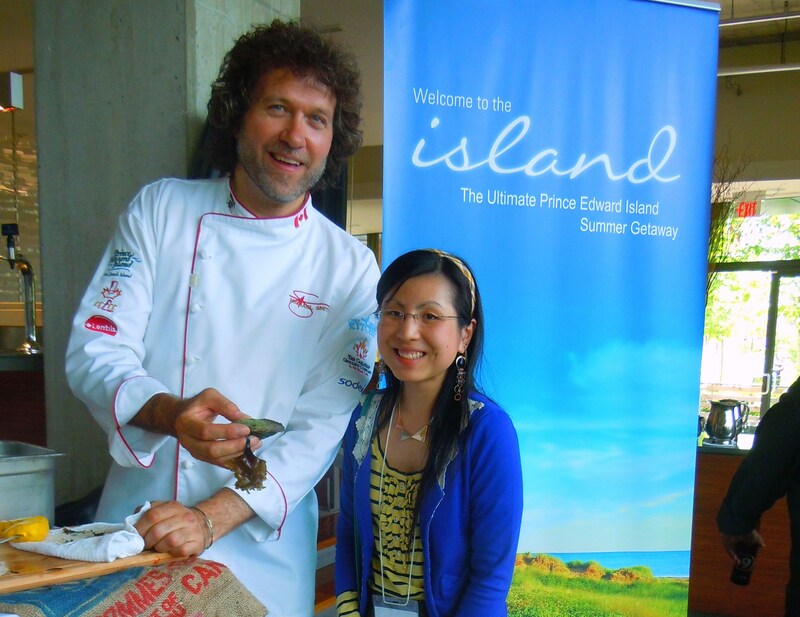 Amazing food, watching others’ passion and drive come alive through cooking and healthy, friendly competition and being in the presence of PEI goodness, fellow foodies, bloggers and Michael Smith made this the best event I have ever been to. 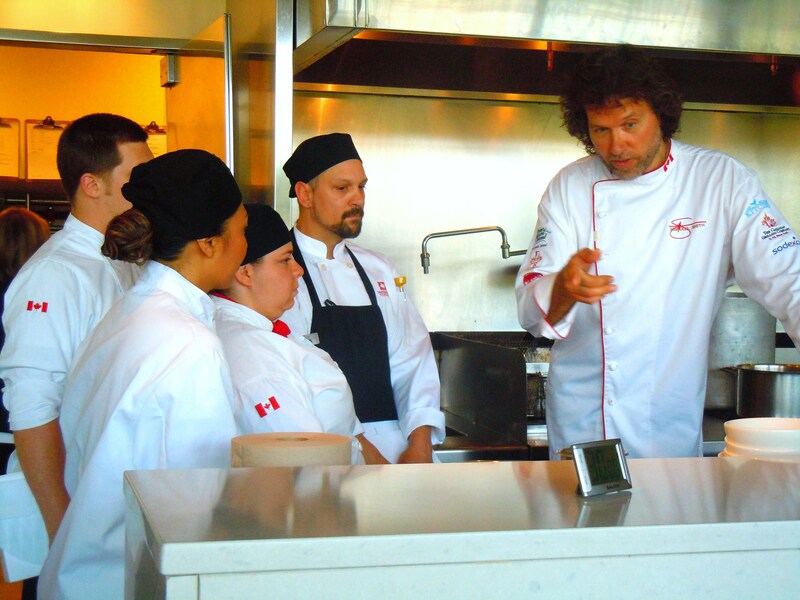 I’ll get to the nitty gritty details about the cooking challenge and the chefs and their dishes in tomorrow’s Part II post; today’s post is all about the love of PEI, food and dreams coming true. The evening started off with plenty of appetizers and nibbles including fresh fruit, veggies, crackers and cheese (I had some of the best asparagus and cheese EVER from the food table! ), mingling with fellow bloggers (food and travel folks), scoping out the “secret” ingredients that the 4 chefs would be incorporating in their cook-off challenge straight from PEI and foraged by Michael Smith himself (fiddleheads! Cat tails! ), watching Michael Smith give the cook-off lowdown to the 4 chefs, and taking so many photos we looked like a mob of papparazzi. 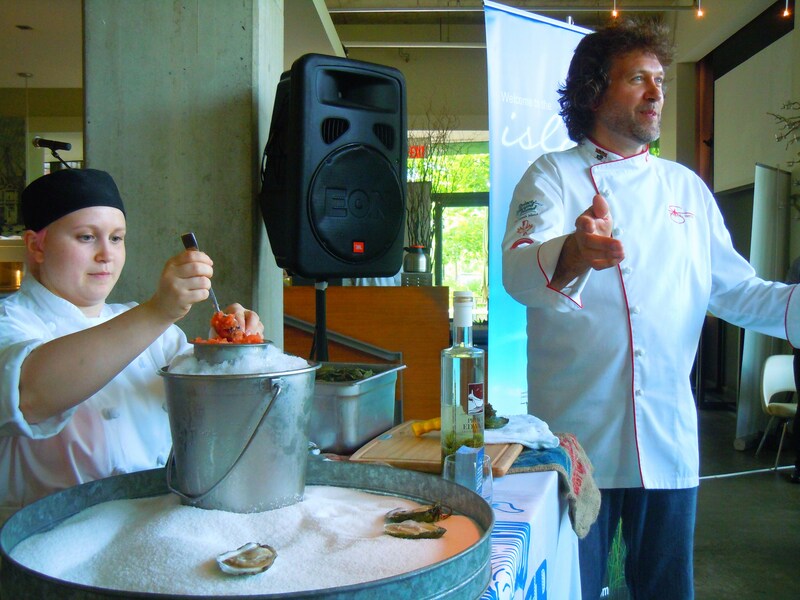 We enjoyed the freshest PEI oysters off the shell, watched Michael Smith give us a fun oyster shucking show (and learned the “Oyster Society” oath! 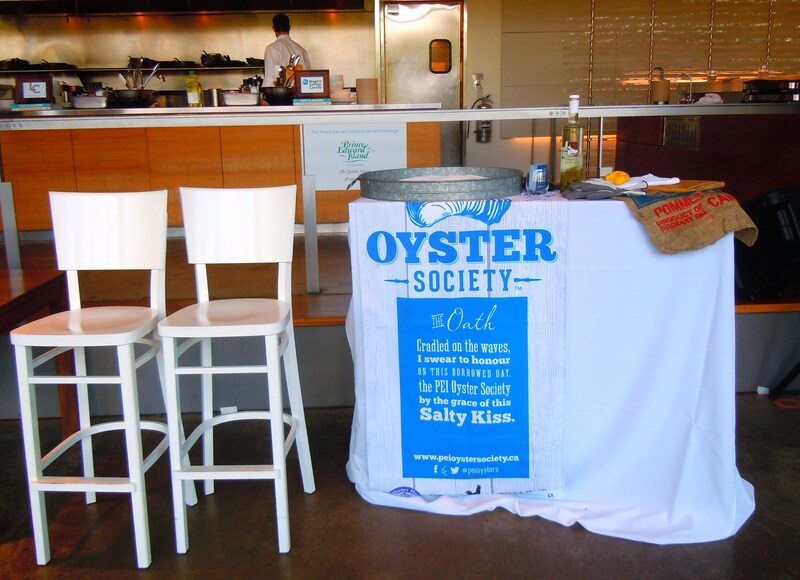 ), watched others learn how to shuck oysters for fun, listened to Michael Smith talk about the “art” of oyster eating (chew! Don’t just swallow! You’re missing out on the yumminess!) and ate mouthwatering, scrumptious PEI hors d’oeuvres including PEI lobster (fresh chunks on soup), PEI beef and potatoes (slices of steak on mashed potatoes), smoked salmon, and more. 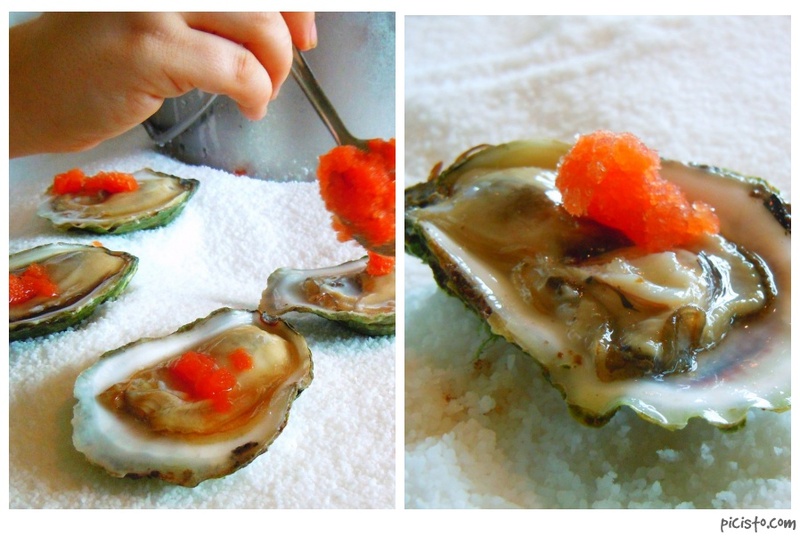 “Cradles on the waves, I swear to honour on this borrowed day the PEI Oyster Society by the grace of this Salty Kiss”. 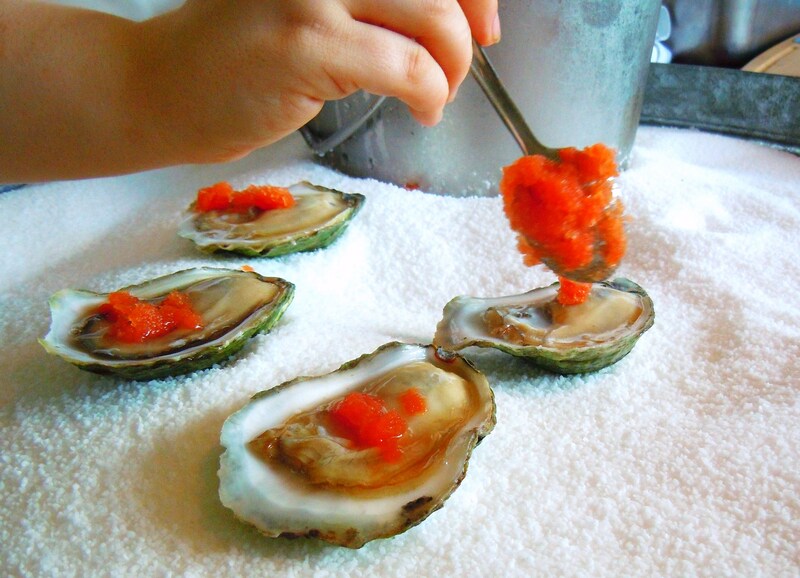 And to that we slurped our oysters. This event was beyond anything I could have dreamt of even in the happiest corners of my brain. I really don’t think Emily from Mosaic knew just how much an event like this would mean to me; it was truly a happy, lucky, meant to be coincidence. Going to Prince Edward Island has been on my bucket list for years. Vacationing there even for a week would be a vacation of a lifetime for me. I mean, sure, this heartfelt desire to feel the island breeze through my hair is due in part to Anne of Green Gables being my all-time favourite book and love story (I even scrapbooked a photo of “Anne” and “Gilbert” I found online in my Valentine’s/love themed scrapbook years ago, wishing on a star that I would someday find the same kind of love for myself and lo and behold, I have), but there is so much about PEI I want to taste, learn about and explore. 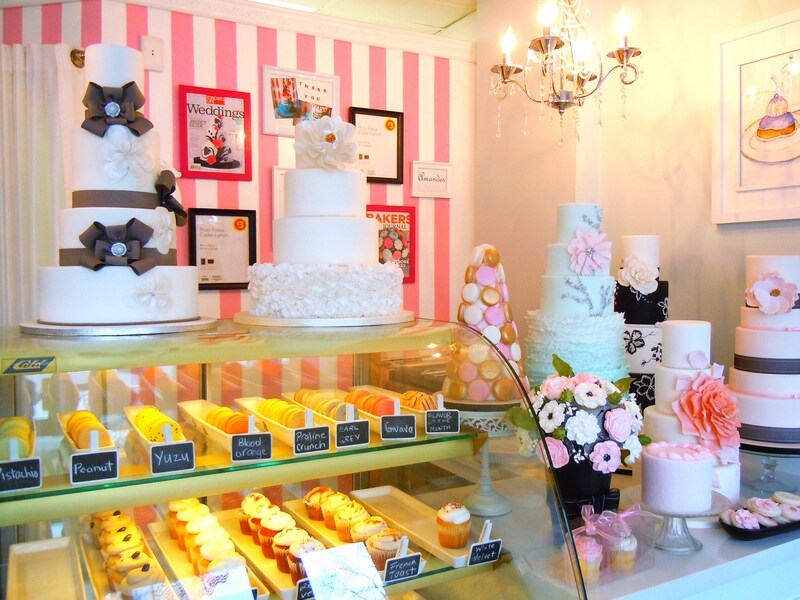 The food-crazed girl in me even did a Google search on cupcake shops on the island and summer food festivals. You know, to keep in mind for that dream vacation. And being part of an event hosted by Tourism PEI and Michael Smith. Wow. 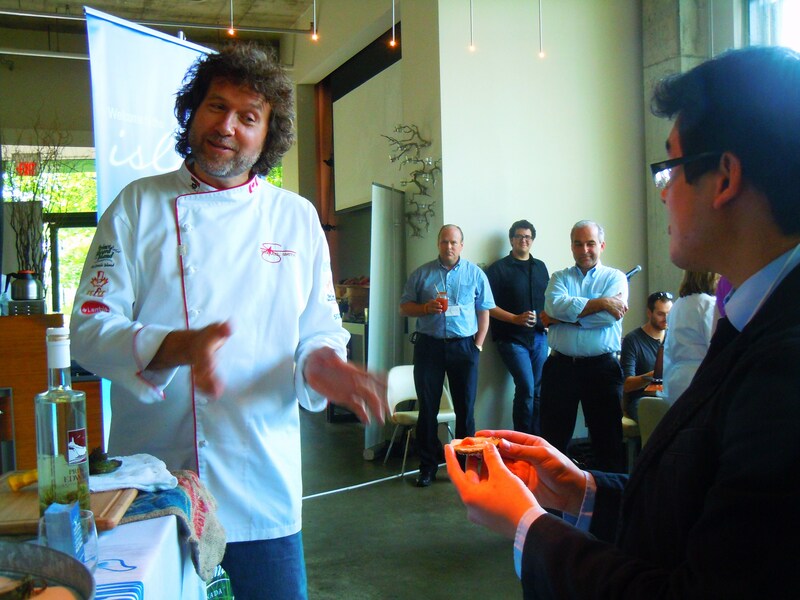 I’ve been watching Michael Smith on Food Network for years and he’s been my favourite. Any spare time I had during university when I wasn’t at school or working or writing papers I was glued to the tv watching Food Network, watching episode after episode of Chef at Home, oohing and ahhing over how cute his son Gabe was, watching him make salad and plating it in a Tonka truck (um, the tomboy in me loves Tonka trucks), learning about those basic cooking aromatics, and drooling that pantry! I love those memories and never in my wildest dreams did I think that I would someday meet him. 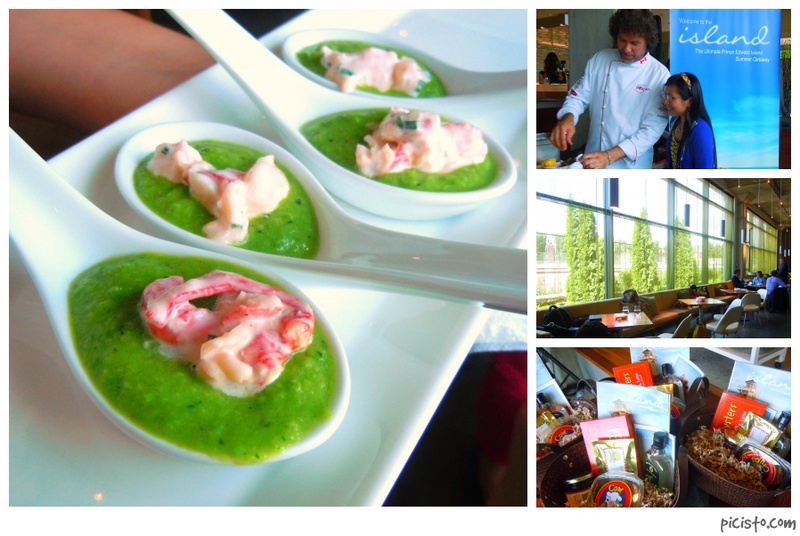 I am so happy I got to take part in such a fun, delicious, memorable and might I say, well-executed, event! 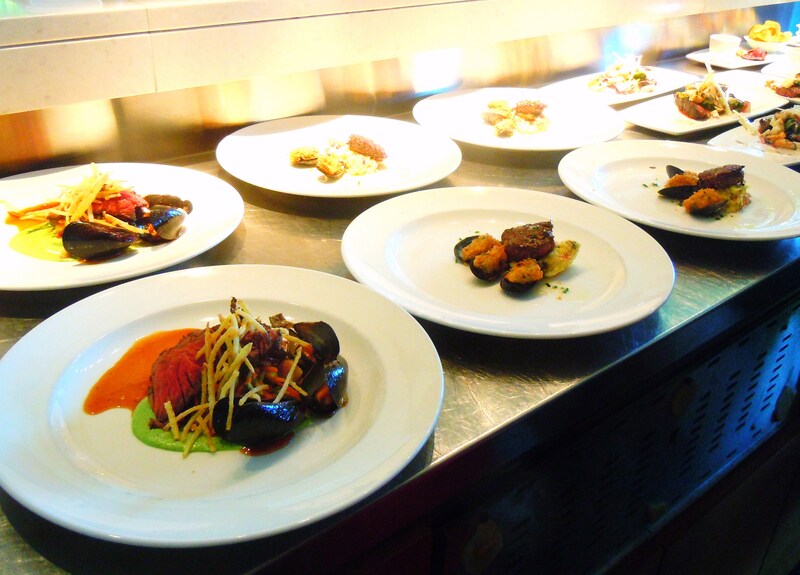 The Part II post will be all about the cook-off challenge, the chefs and their dishes!